It's time for more travel updates! 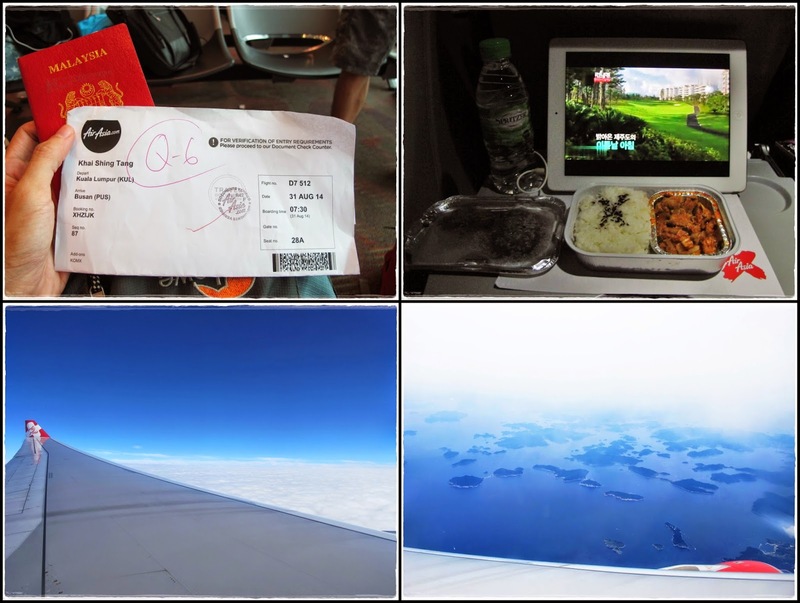 After Australia and Norway, my third travel destination for the year was South Korea...Busan and Jeju Island to be specific coz I've been to Seoul 8 years ago. I usually try to avoid traveling to places that I've been before but Korea was an exception, thanks to all the K-variety shows and K-dramas that I've been hooked on to for the past 2 years. =P Well of course I'm not that rich to travel there just for this reason, especially after two expensive trips this year. So what brought us to Busan? 20,000 AA points that I received for signing up for Std Chart's credit card earlier this year and an irresistible deal. 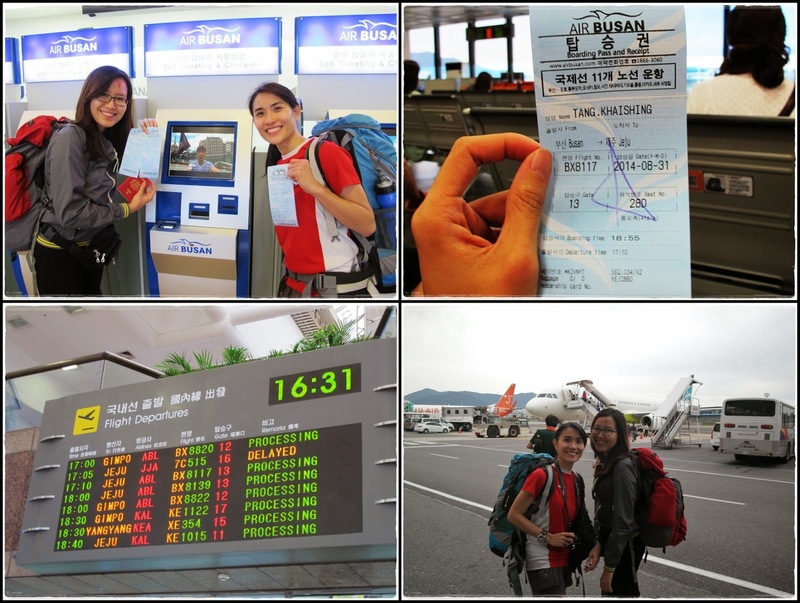 Return tickets for 2 person from KL - Busan for only RM 212 (all-in)...so freakin' cheap!! Looking back now, I should really thank that credit card sales person for being so persistent in persuading me to get the card. I was told that I will get 25K AA points by just signing up for the card without any hidden fees or preconditions and this was really 咁大只蛤乸随街跳. 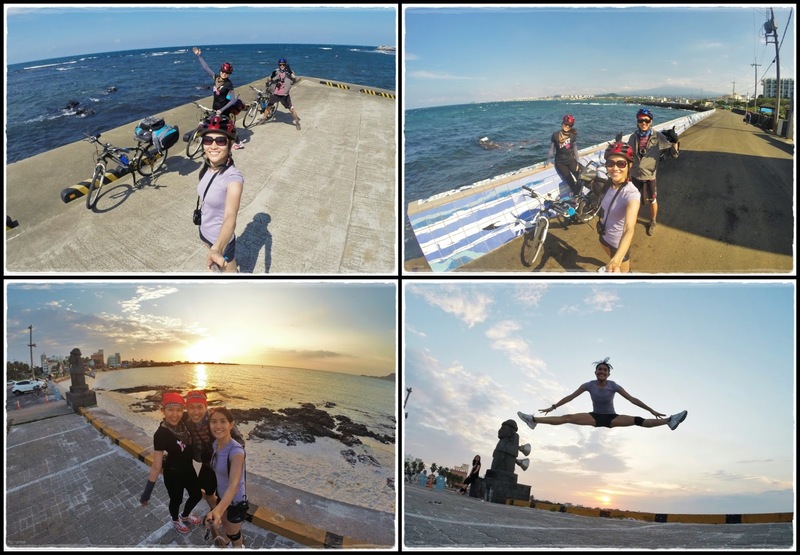 This cycling trip was definitely a memorable adventure. 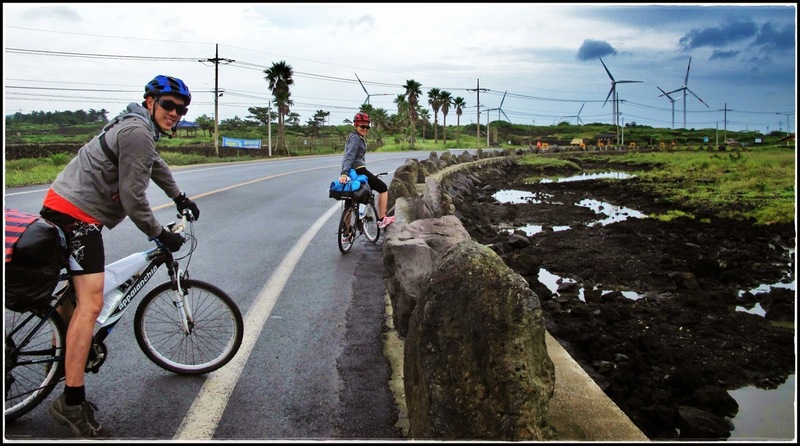 We cycled through rain, wind, and sun; challenged our physical fitness and determination; met lotsa nice and helpful people along the way; and saw many parts of Jeju that most people wouldn't see on an ordinary tour. Yes indeed we took the road less traveled and opted for the much more tiring option but this is the best time to go on such crazy adventures; when we still have the enthusiasm and fitness to do so. =) 用了5天的时间，骑行环绕了济州岛270公里，也晒黑了一圈。也许有些人会觉得旅行何必把自己搞得这么累，自讨苦吃；可这种疯狂的旅程就是要趁年轻去体验，去挑战自己! My nerdy piece of 'art' to decide on our travel dates. I wanted to travel in October (autumn) but we ended up choosing September to accommodate bro's work schedule. 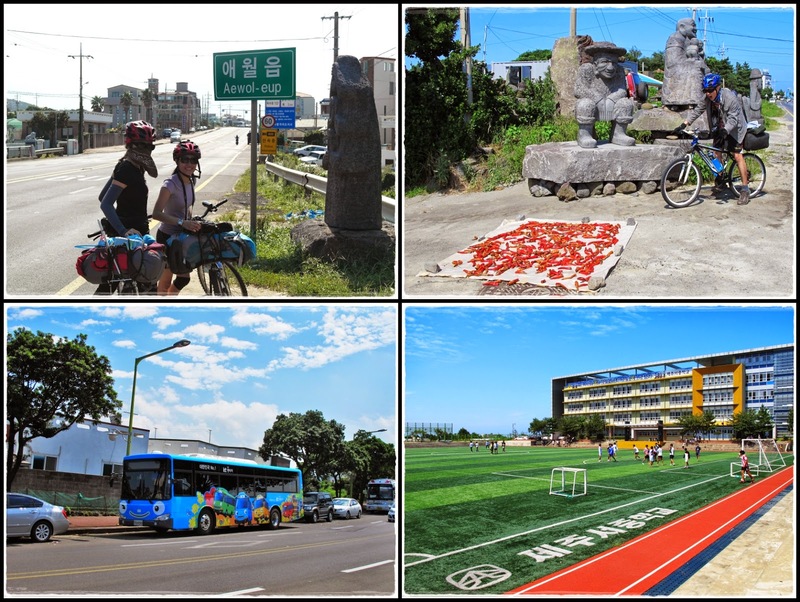 8D7N for Busan and Jeju was plenty and that was how I came up with this 'brilliant' idea of cycling around Jeju Island. 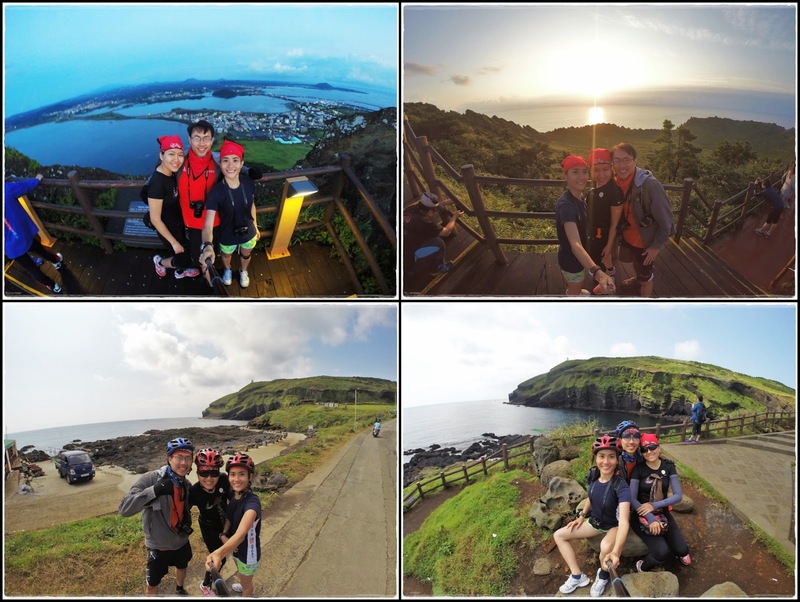 Honestly, I'm not a big fan of cycling but I wanted to try out something new and cycling round Jeju Island seemed to be a feasible challenge to accomplish so we decided to just do it! I admit, I don't like sports that require stamina and I don't like using my thigh muscles. But for the sake of this trip, I had no choice but to do some cycling training to prepare myself for cycling more than 200 km in 5 days. I started the 'training' by cycling 10 km in 32 minutes and I was bored already. The maximum I cycled was 20 km in an hour...that's it. I figured that if we only cycle for about 40-50 km per day, that means we should be able to complete the ride within 2-3 hours each day...and I thought that should be pretty doable. Reality proved that I was very wrong with this underestimation...lol!! Woke up super early to catch the 8.30am flight to Busan. 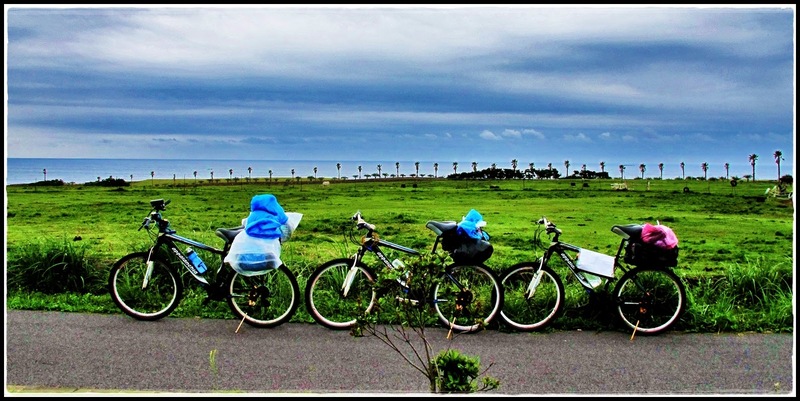 Each of us carried only one backpack and traveled light coz we had to carry our bags on our bikes for the entire journey. 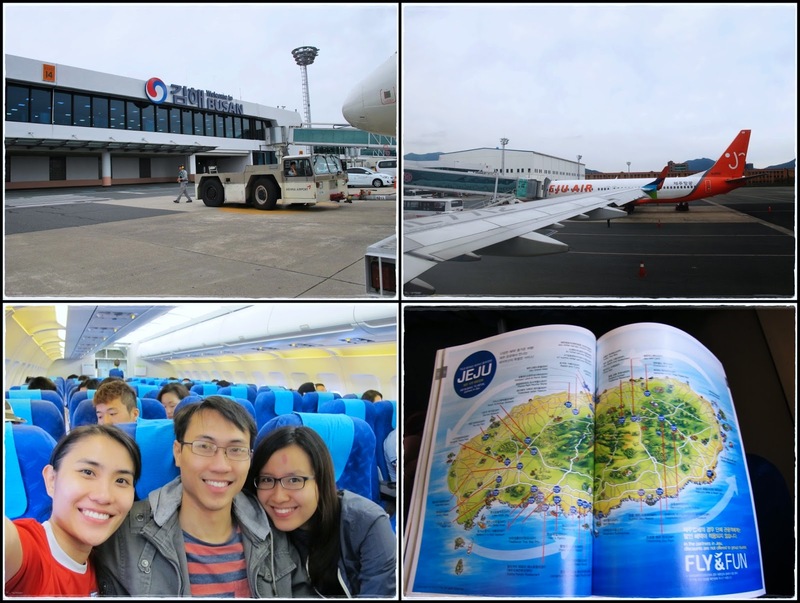 We had 1.5 hours of layover before catching our domestic flight to Jeju at 5.10pm. Wanted to rent an Olleh wifi device from the airport but we were told that the signal is not strong in most part of Jeju so we decided to hold on and find out more after we get to Jeju. 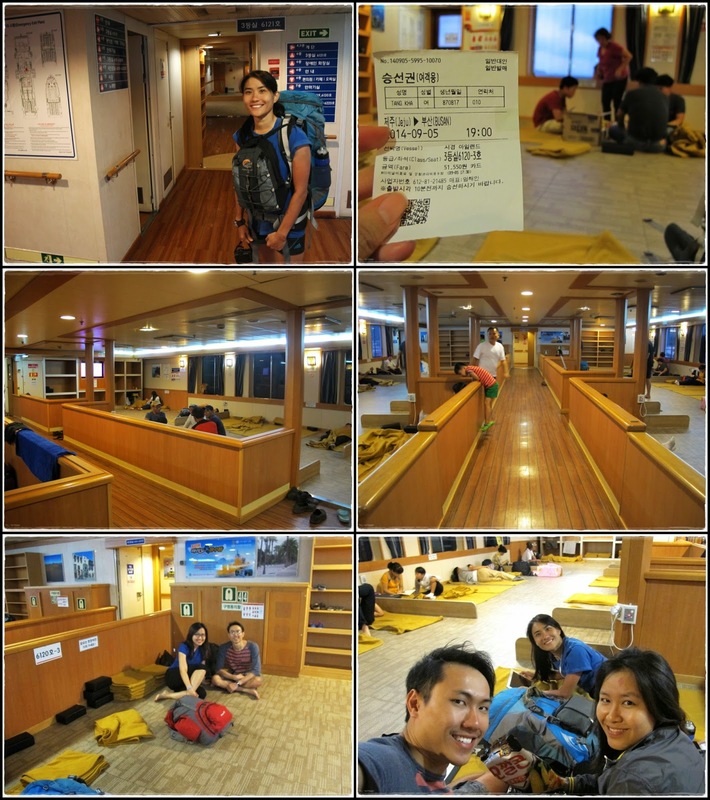 Our initial plan was to take an overnight ferry from Busan to Jeju but too bad the ferry doesn't operate on Sundays. 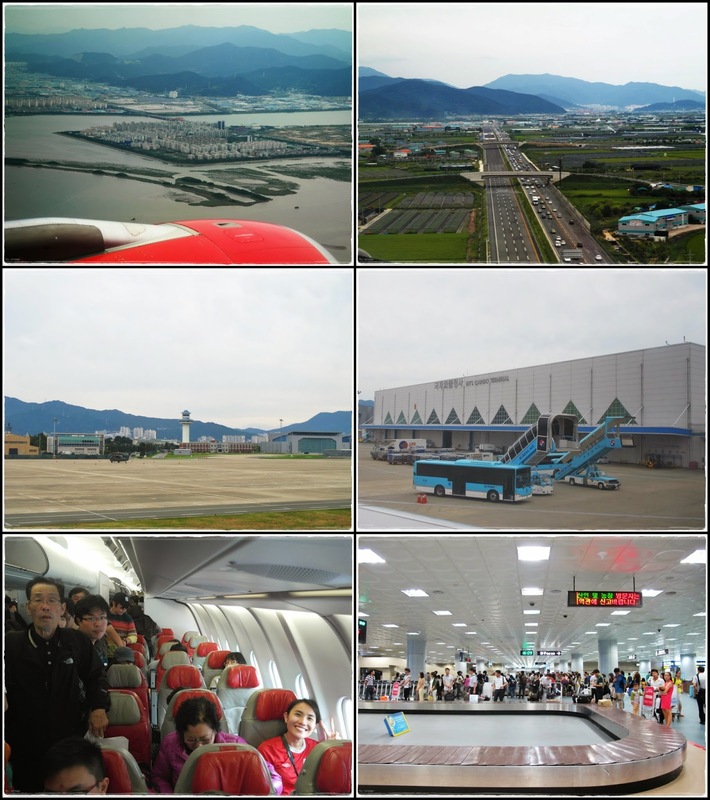 That's why we bought our flight tickets from Busan to Jeju only 10 days before the trip and surprisingly, the tickets for Air Busan was still pretty cheap. 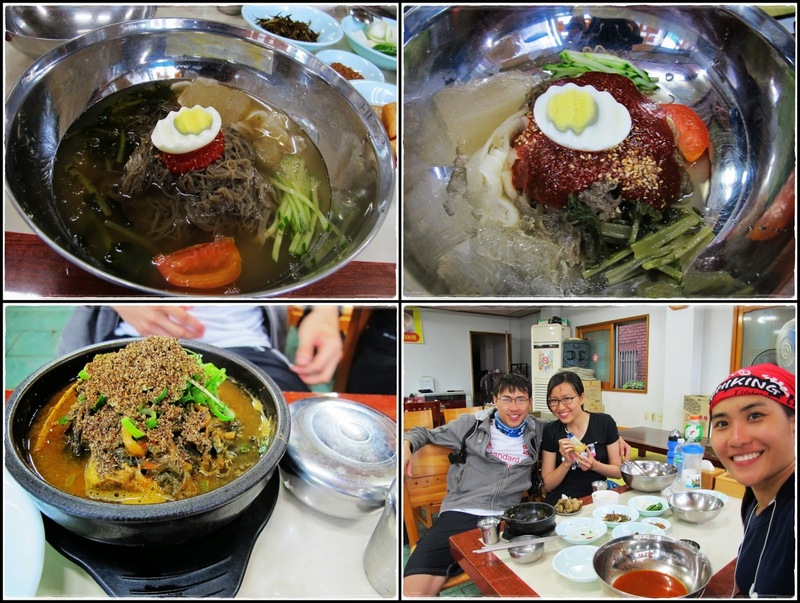 We paid only KRW42,200 (RM130) per person, even cheaper than taking a ferry. 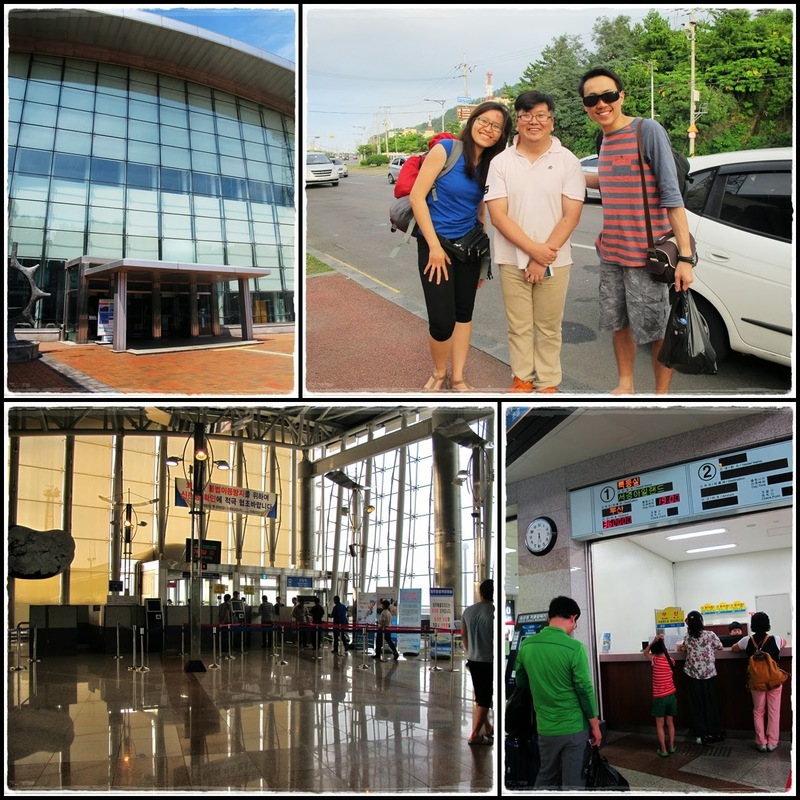 Goodbye Busan...cya 6 days later!! 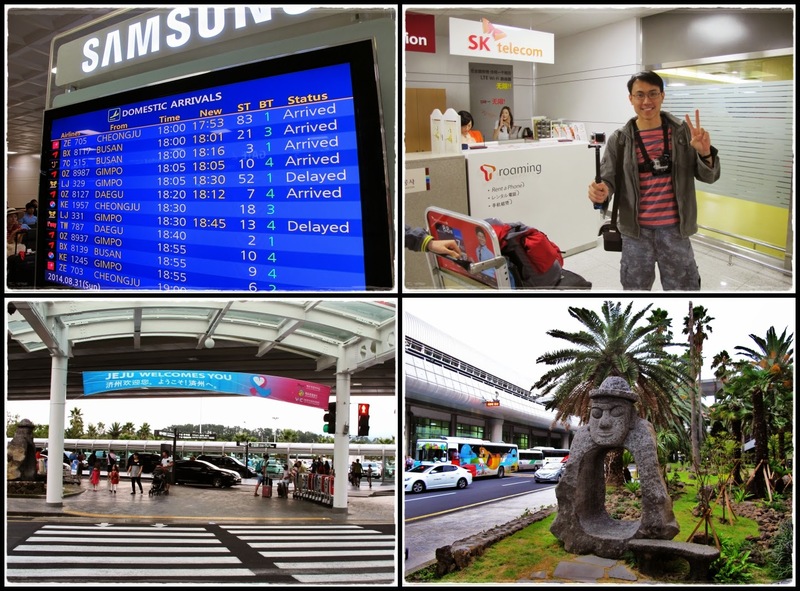 Annyeonghaseyo Jeju!! 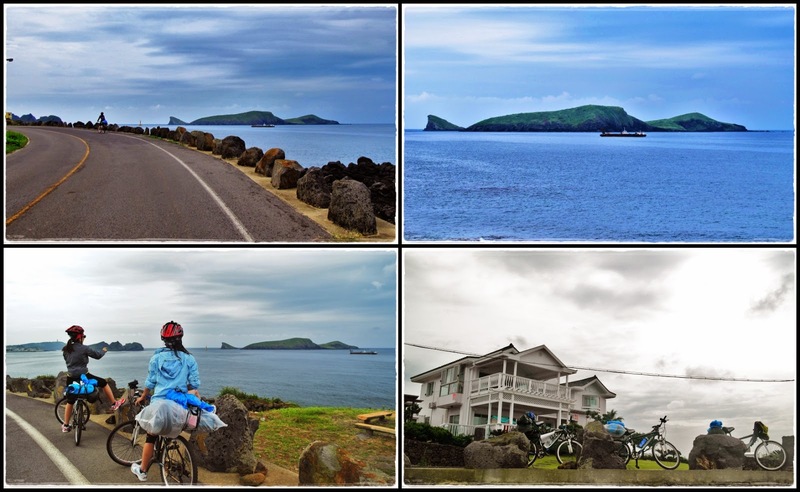 As we were cruising above the island, I was thinking to myself...OMG are we seriously gonna cycle round this huge island in the next 5 days?!?! 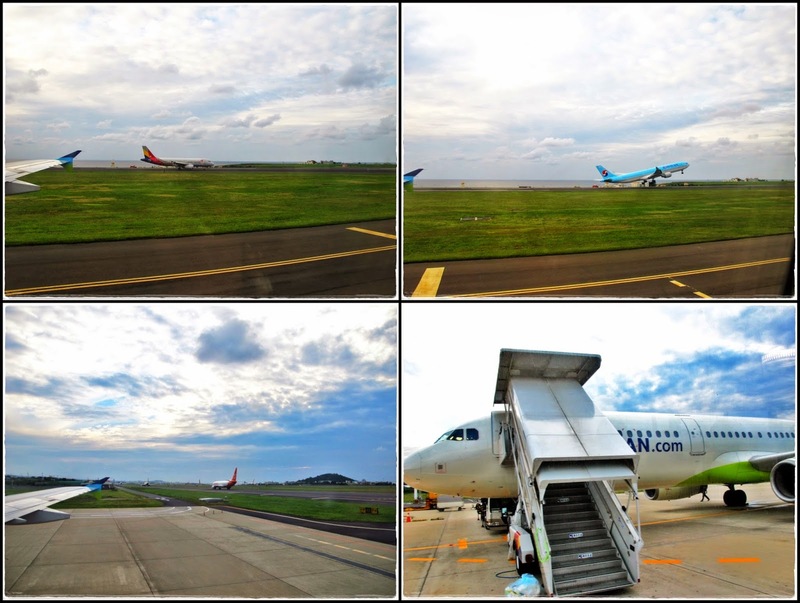 Landed at Jeju at 6pm. This airport is small but busy. There's either a plane taking off or landing every 5 minutes. First things first was to ask about SK Telecom's wifi modem. Hahaha...sounds as if I couldn't live without internet. Actually, we needed this to help navigate our cycling route. We could have rented a modem slightly cheaper on Wifi-Korea prior to the trip but it was too late when I found about this. 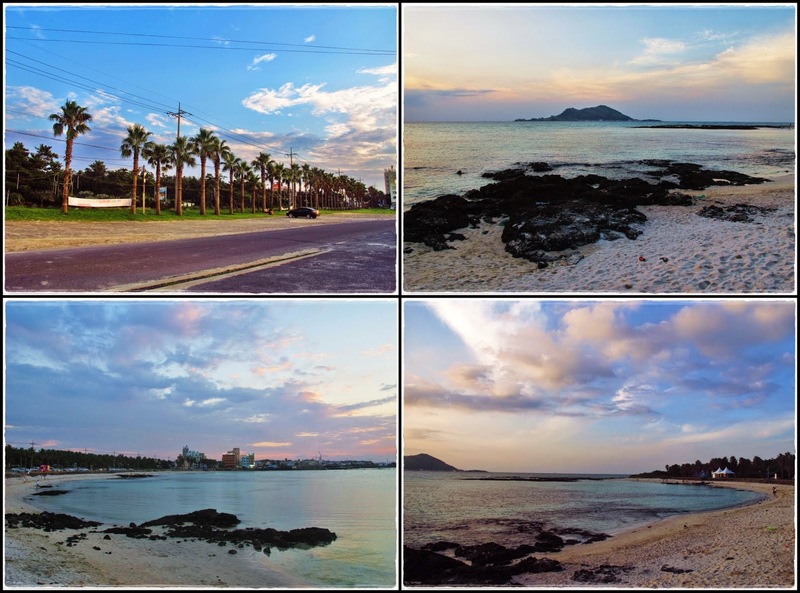 I can understand why Jeju is known as the Hawaii of Korea. The palm trees, blue sea and ocean breeze puts you into a tropical vacation mood instantly! 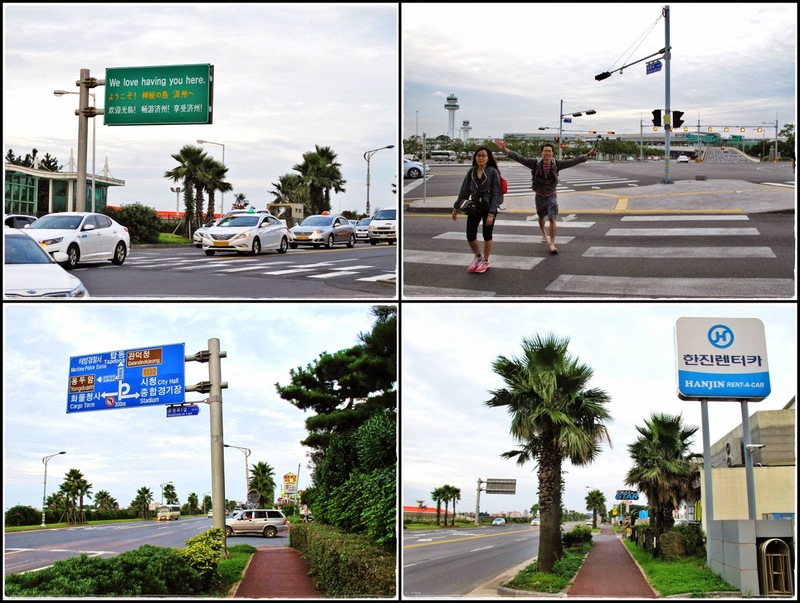 Walking 1.2 km from the airport to the hostel with our backpacks...no sweat!! 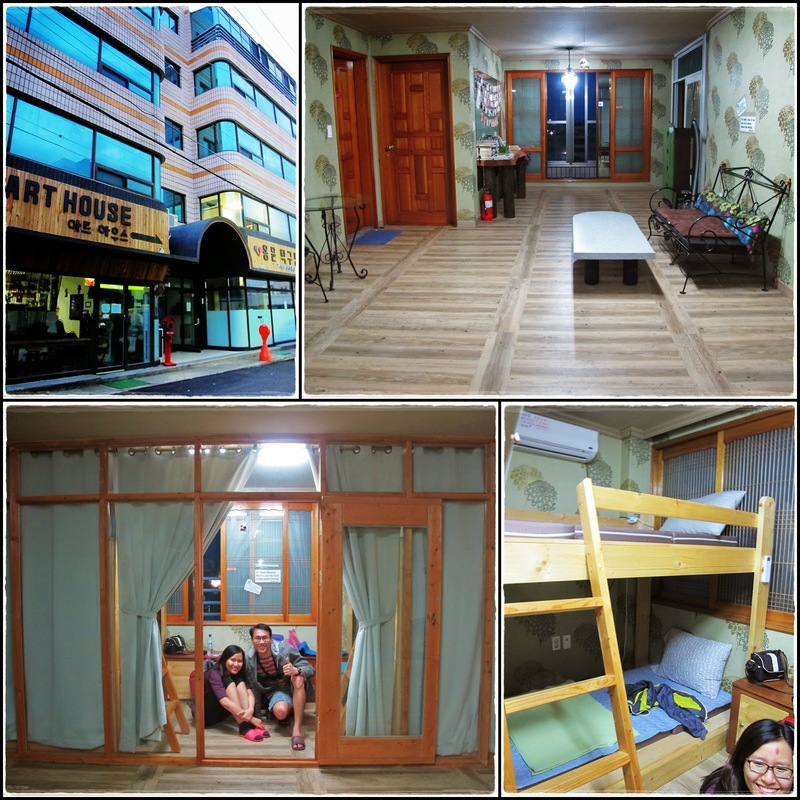 We stayed at this cozy Art Airport Guesthouse on our first night in Jeju coz it was near to the airport and the bicycle rental place. The host was very nice and her Mandarin was pretty good. 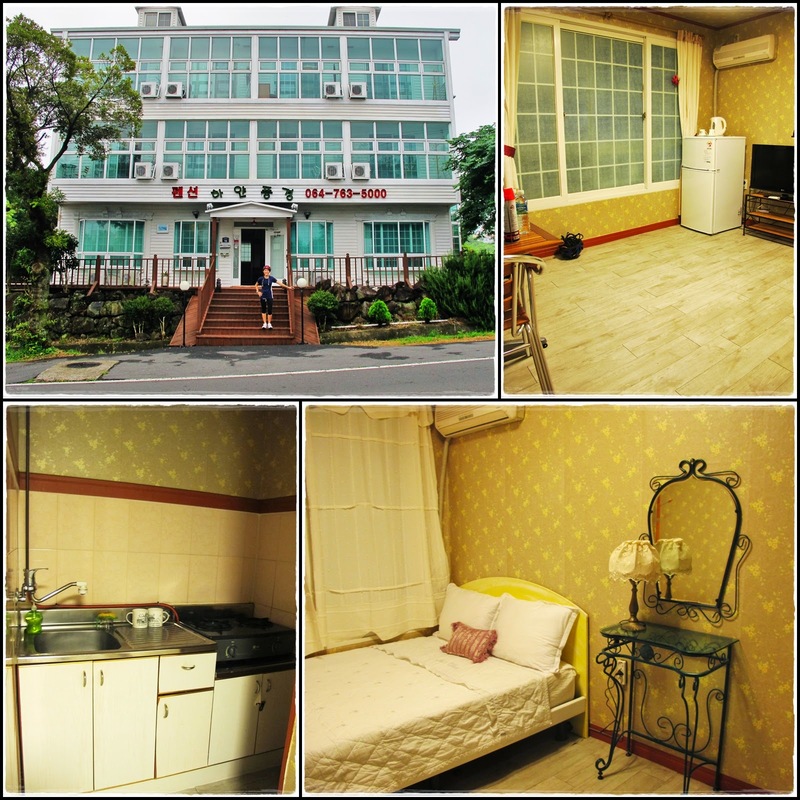 We booked the 4-bed mixed dormitory room for RM62/pax (including breakfast) and got the entire room for ourselves. 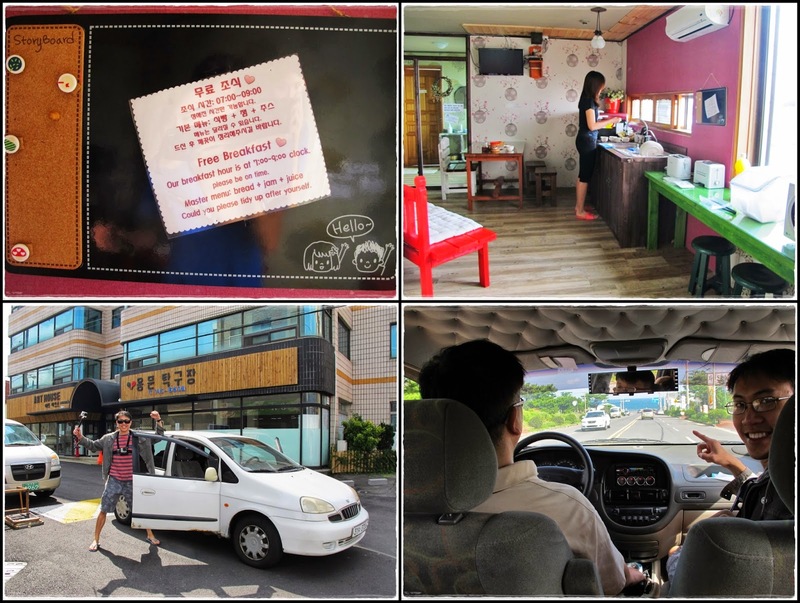 Jeju is famous for black pork and the hostel host recommended this Black Pork Street...oink oink!! We decided to splurge on this meal coz we were starving and wanted to have something good before we begin our cycling 'boot camp' tomorrow. But looking at the ambiance in the restaurant, we knew that we've made the right choice to come here and the food should be good coz the restaurant was packed with locals. Certainly, the food did not disappoint. Or perhaps we were just too hungry...lol!! Lost count of the number of times we refilled the Banchan (side dishes). We definitely didn't waste any food...as you could see. 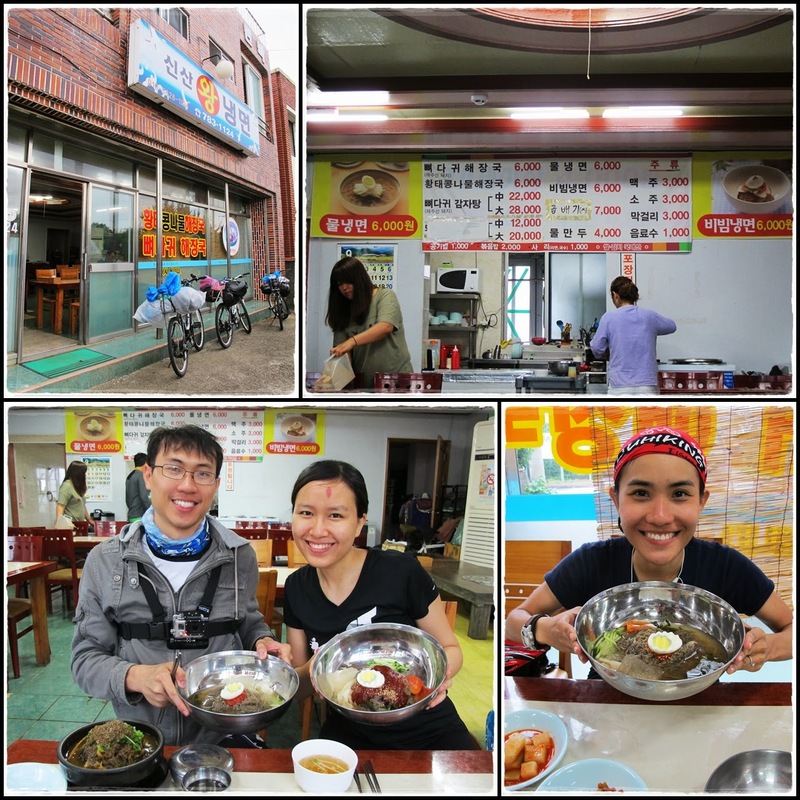 Our total bike rental cost for 5 days (including helmet) was KRW68,000 (RM210) per person. Not sure if this was a good deal but at least it was within our budget. We were also given raincoats, baggage ropes, locks, bandana, maps, and a tent for free. 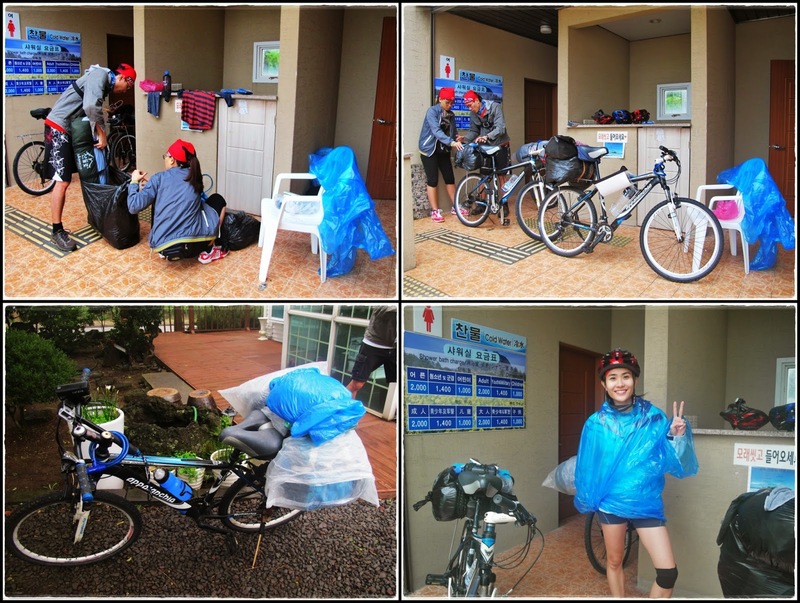 The staff provided us with lotsa information on our planned route of cycling counter-clockwise around the island and also accommodation options for our 4 overnight stops. All set and ready to go!!! Let's do it!! Crazy bro was in Merdeka mood...lol!! What a 'good' choice to begin our journey at 12pm...hot die us. =.= Even though summer was over, the weather was still pretty warm. The first part of our ride was relatively boring with no scenery, just getting out of the busy city. Our first rest stop - lunch break at convenient store and replenish our water supply. Random sightings along the way. I was excited to see a Tayo bus...'side-effect' from watching too much Korean variety shows...especially the ones with kiddos. 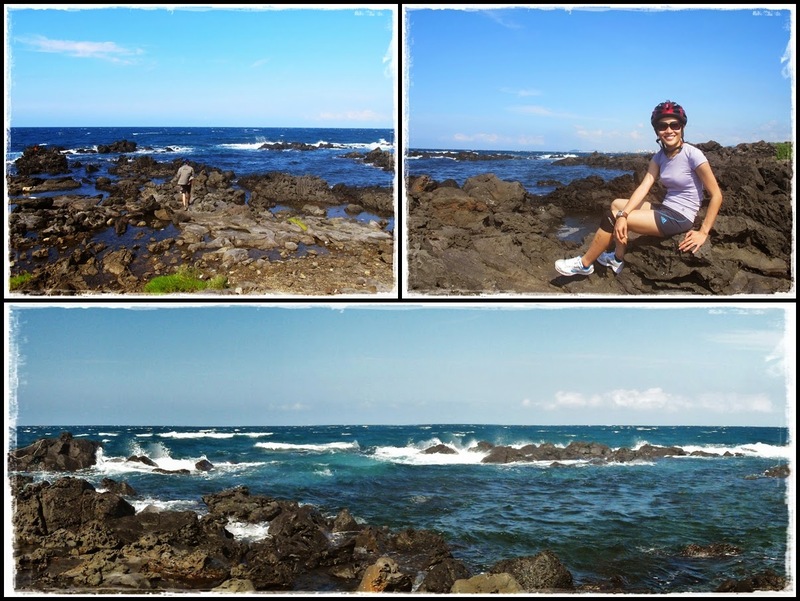 Breathtaking deep blue sea and black basalt rock landscape as we cycled along Iho Tewoo - Hagwi - Aewol coastal road. 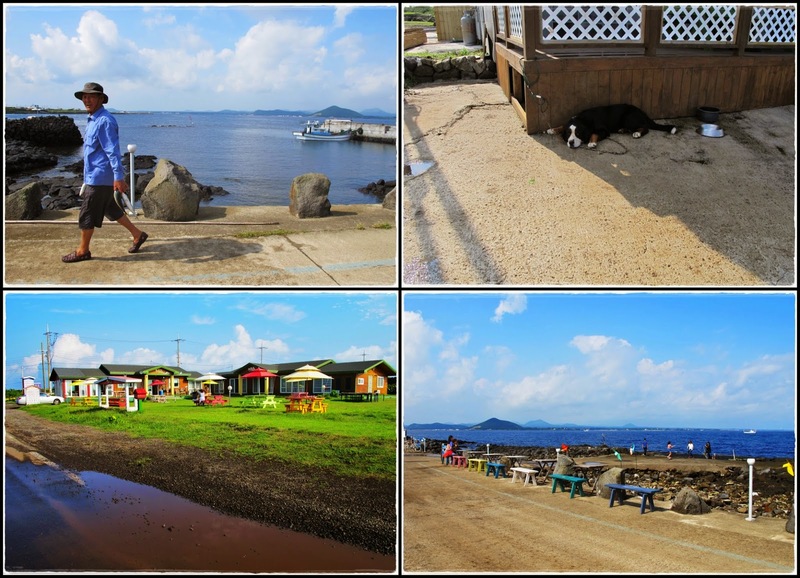 Some nice guest houses (pension) along the coast. 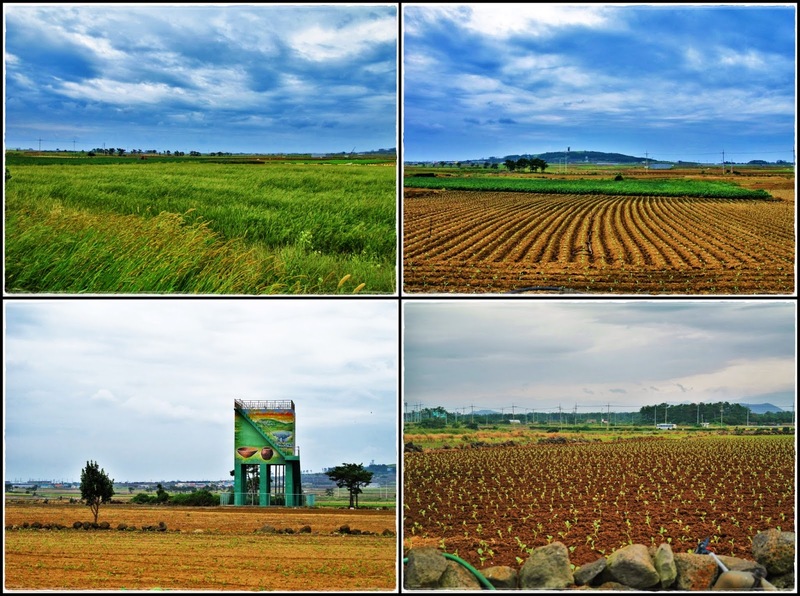 After having enough of sea views, we took a turn into the inland towards Aewol Elementary School and had a change in landscape...farm lands and Yeonhwa Mot Pond. Last stretch of the day along Suwol-ri Coastal Drive. At this point, we've already been cycling for 6 hours...doubled my original estimated time. Fortunately, the weather had been nice. 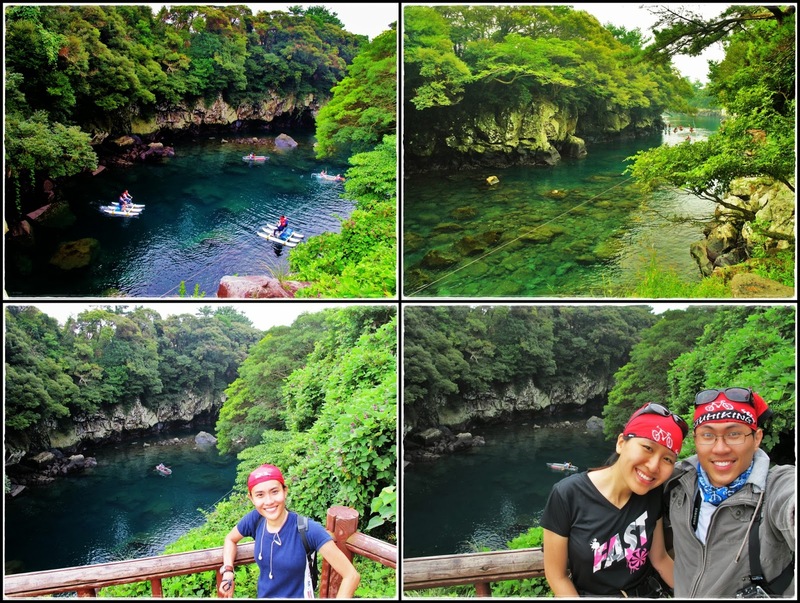 Checking out Hyeopjae Beach...this wasn't our final destination. Honestly, the beach was kinda disappointing but surprisingly there were quite a lot of people. 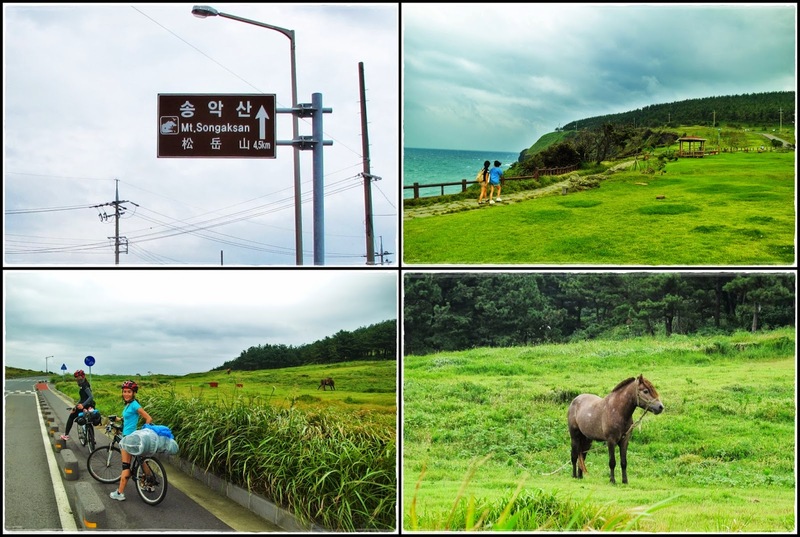 Pedaled on for 5 more minutes and finally arrived at our final destination for the day...Geumneung Beach!! 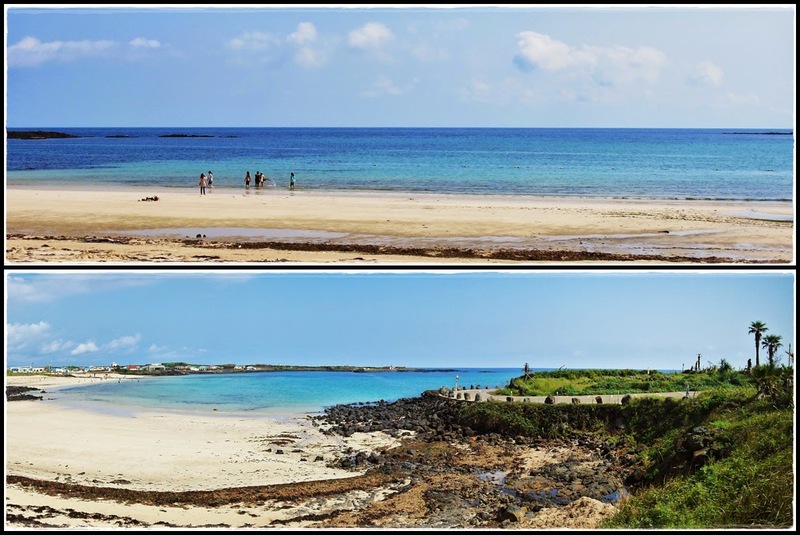 Much nicer beach and less crowded!! 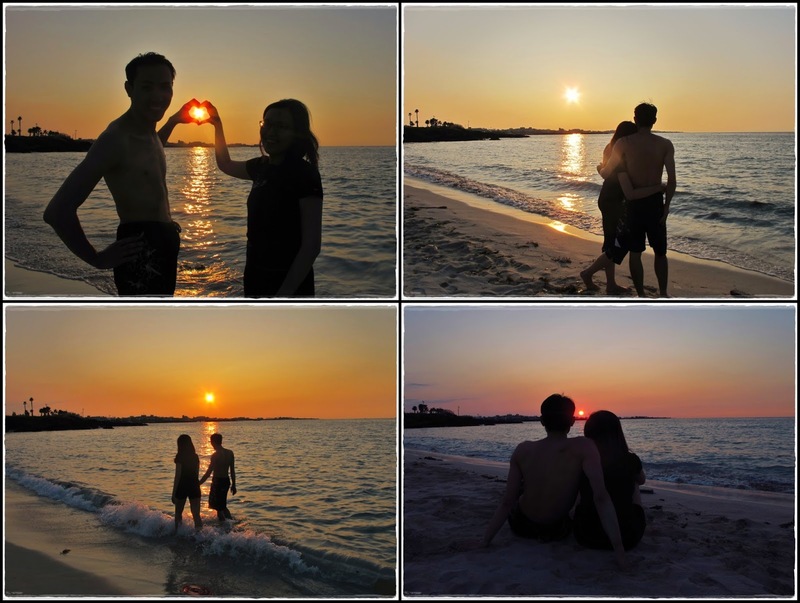 We were lucky to see such a beautiful sunset on our only day in the West of Jeju. 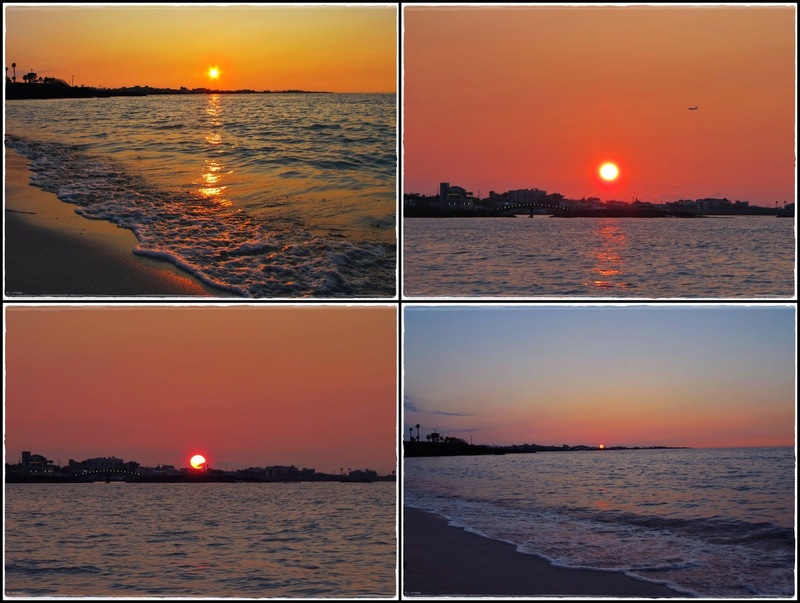 What a perfect way to end our day! Guess what's our accommodation for the night? Nope not a bath house. This bath house was closed coz summer season was over. But lucky us, the men's bathroom wasn't locked! We were more than happy to get a free cold shower after a tiring day...who cares if this was an open shower for men...lol!! Desperate times call for desperate measures. Sometimes basic little things like this is enough to make us happy. Dinner at convenient store again coz we were too tired and hungry to go anywhere far. 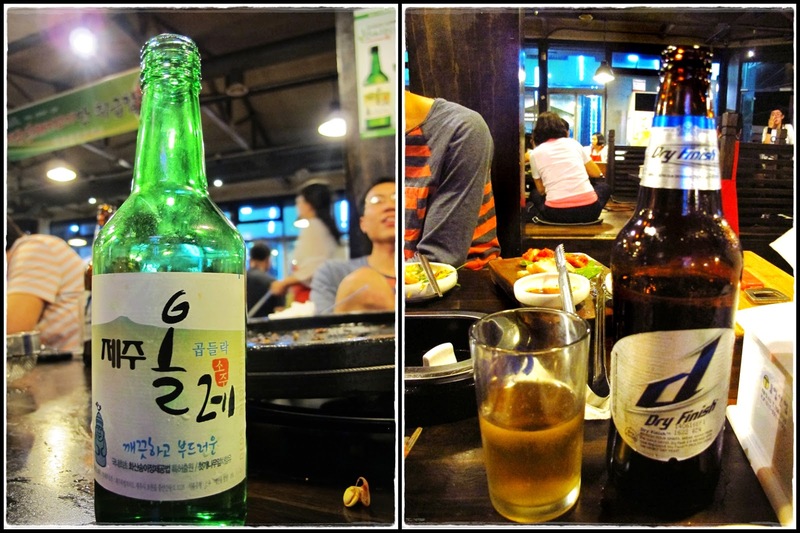 Pork chop rice, kimbap, Korean beer...nothing fancy but very satisfying!! This answers my question above - camping for the night! So exciting...lol!! 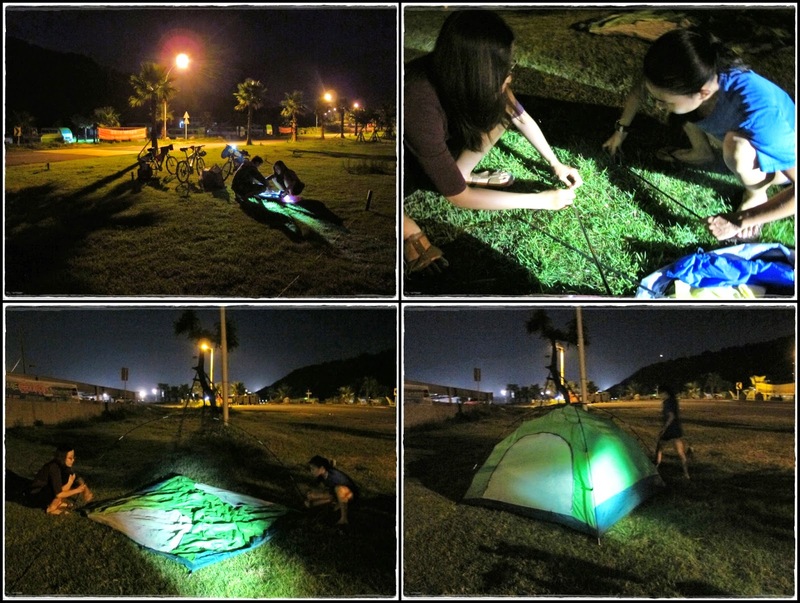 =) Can't waste our energy bringing a tent and 3 sleeping bags for nothing right? 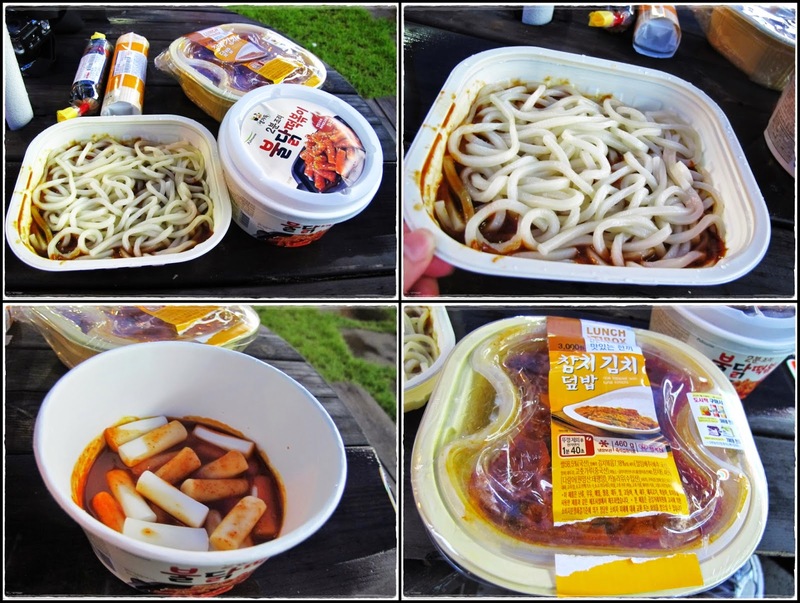 This was my first time camping and I admit I was influenced by K-variety shows to try out camping. 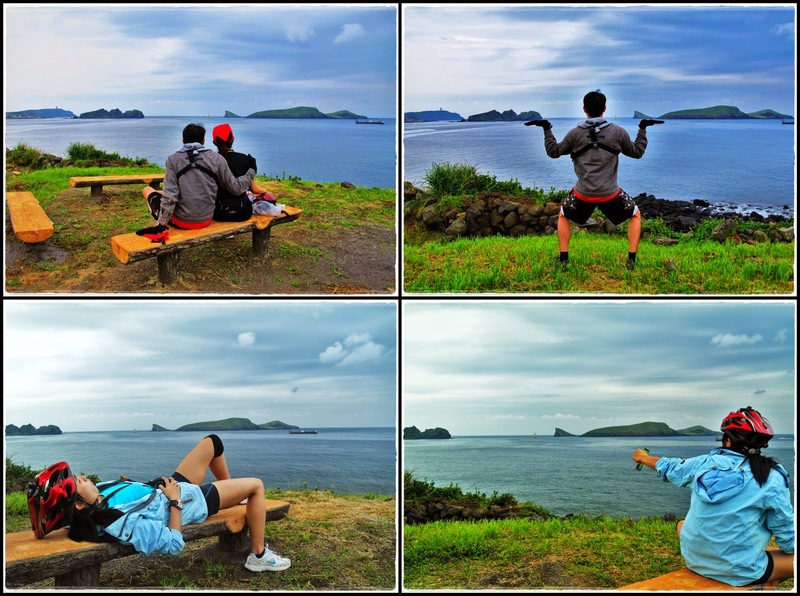 Besides, this is the best way to be close to the nature, we fell asleep with the sound of the waves. Best of all, this was FOC!! Gotta start our day early coz we've got a long way to cycle today. 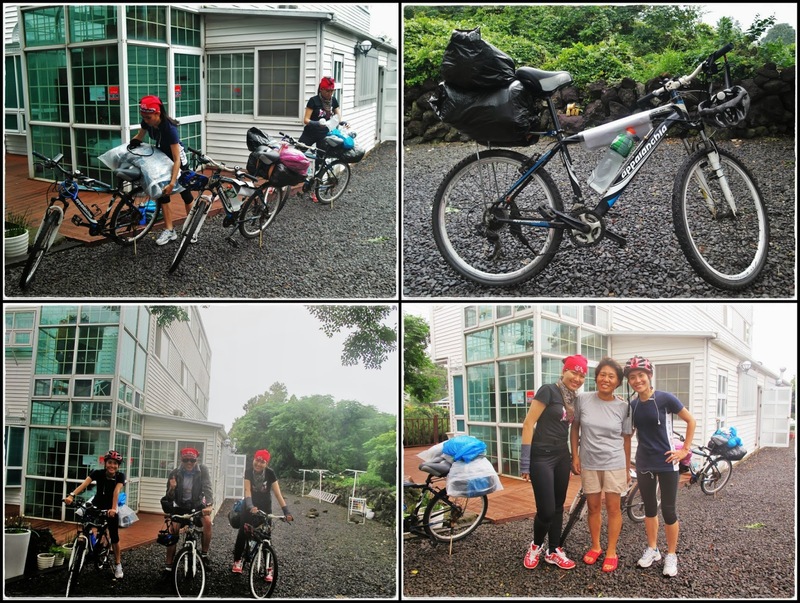 It started drizzling just as we were about to depart so we spent half an hour getting 'geared-up', packing everything into plastic bags and putting on our rain coats. The black plastic bags made us look like we were carrying trash so I opted for the nicer transparent plastic bag...lol!! Finally started our journey at 8am. Made a quick photo stop at Wollyeong-ri cactus farm. 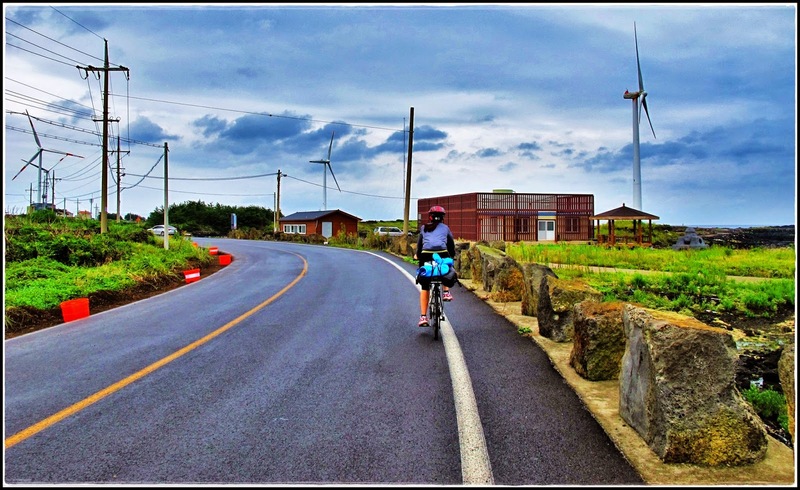 Another photo stop with the wind turbines along Yongsu-ri coastal drive. 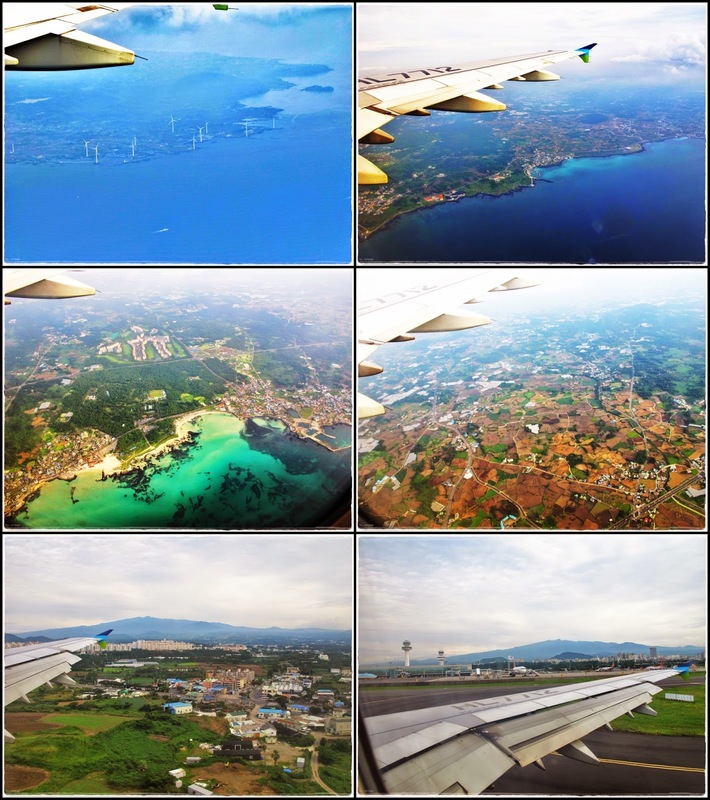 Kinda disappointed that the photos didn't turn out as nice coz the sky was gloomy. 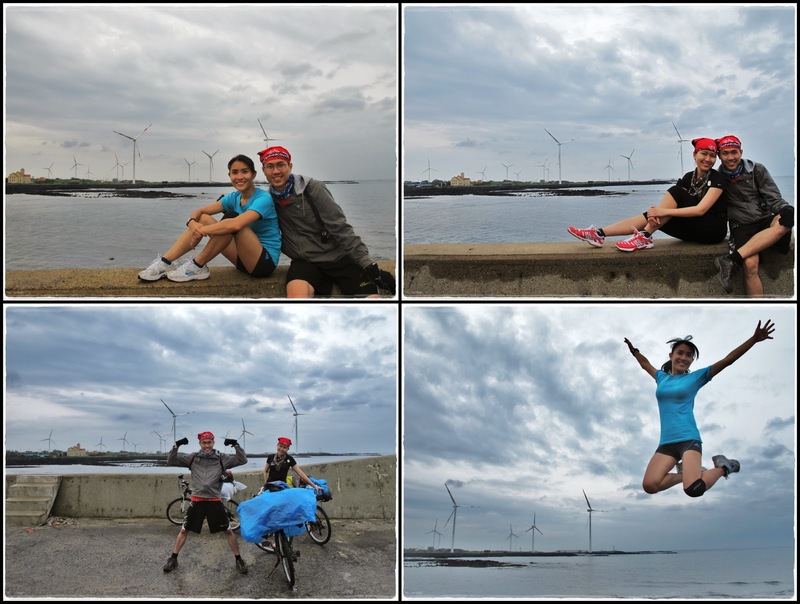 Continued cycling along the coastal road surrounded by wind turbines. Took plenty of wind turbines photos in as we cycled for half an hour coz the wind turbines are so huge and dispersed. Stopped at this random rest area with a view of Wado and Chagwido around 9.30am for a quick cereal bar and water break. After having enough of sea views, we decided to deviate from the coastal road coz we thought the inland road should be shorter and faster. Indeed, most part of the road was virtually traffic-free and we were surrounded by vast farm lands. After battling against the wind for about 1.5 hours, we stopped for lunch at a random restaurant in the middle of the farmland. Most of the customers there were local farmers and the menu was only in Korean. 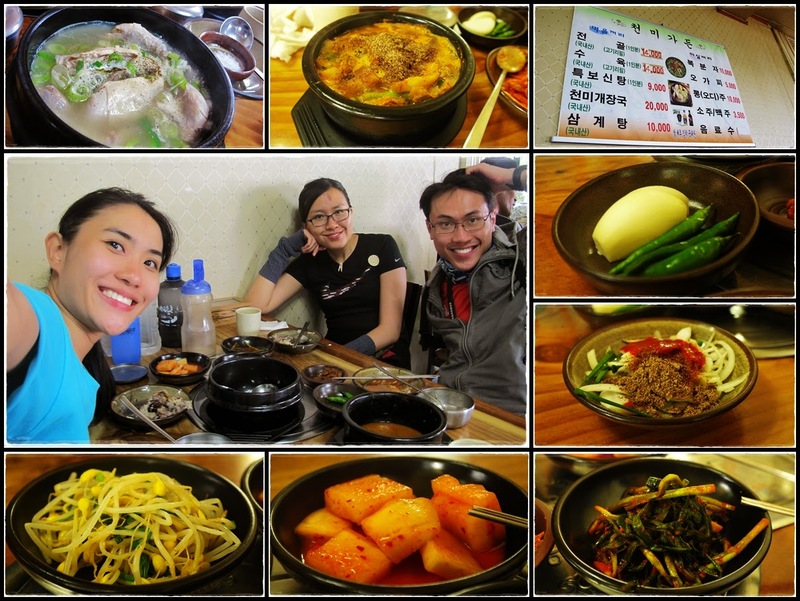 With our very limited Korean words and body gestures, we managed to order ginseng chicken and beef soup. So yummylicious!! Btw, we looked exhausted. 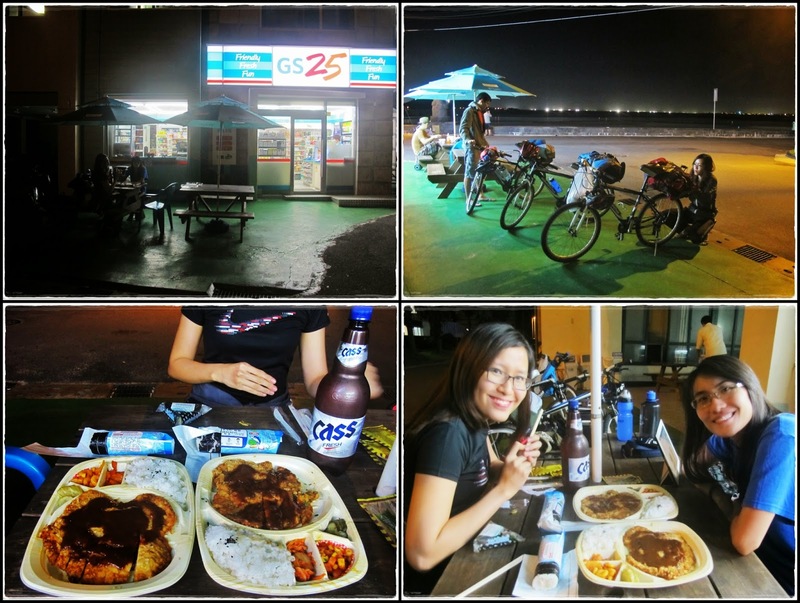 After filling our stomach, it was time to continue our 'battle' with the wind again. 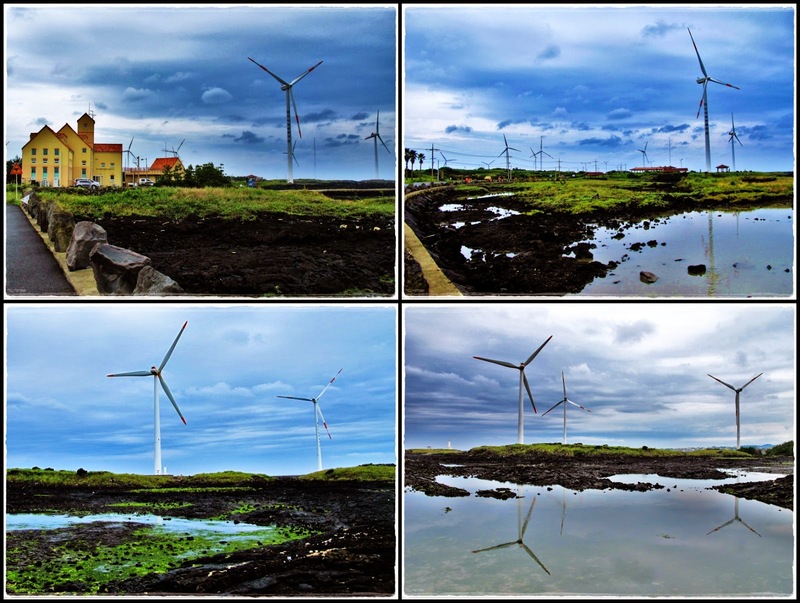 The grass in the top right photo shows how strong the wind was blowing and the bottom left photo shows how hard it was to cycle. This was a real test of our fitness and determination. Quote to share: Adversity if like a strong wind. When things aren't going your way and backing out is not an option, you just gotta keep moving forward, even if it takes twice the effort and twice as long. Made it to Mt Songaksan at 2pm. We've been cycling for about 6 hours now and we've only completed about 60% of our route for the day. Our goal was to get to our destination before it gets dark coz we still haven't sorted out our accommodation for the night. 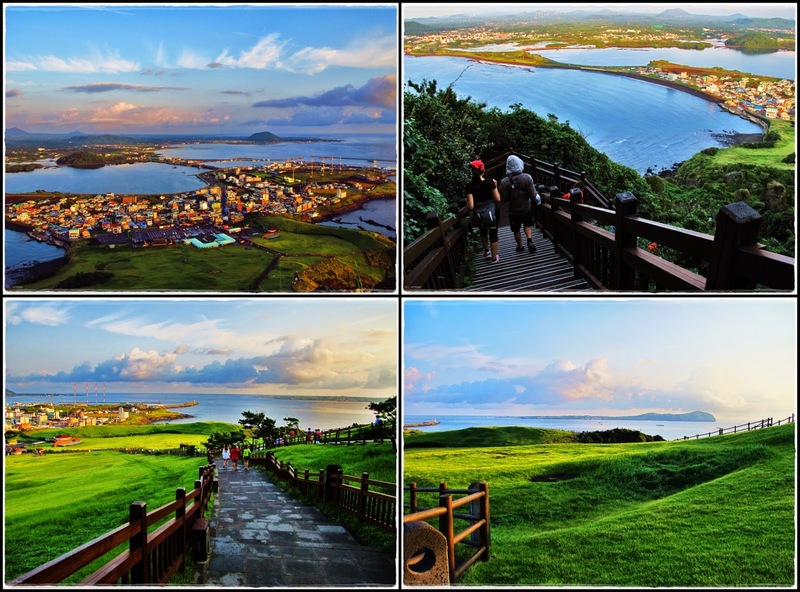 Mt Songaksan is located at the southernmost tip of Jeju island and it offers a great view to the islets of Gapado, Marado and Hyeongje-seom. 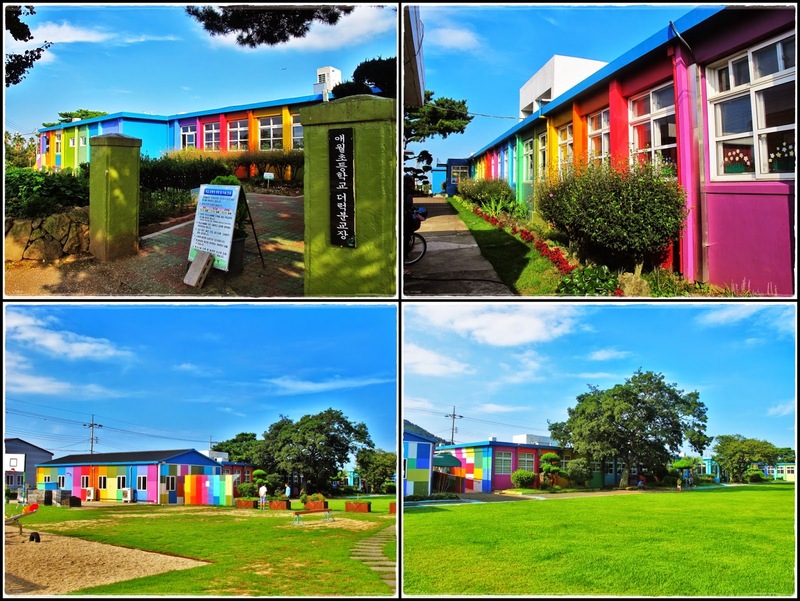 It's also a famous filming spot for popular K-dramas such as Daejanggeum, All-In, Life is beautiful, and Secret Garden. Felt like I could be blown away by the strong wind coz we were right by the sea. Even bro's bicycle was blown down by the wind. It started pouring shortly after we left Songaksan. I had to keep my camera in my backpack and hid it under my poncho to make sure I didn't spoil it. We had to take shelter under this tent coz the heavy rain and strong wind (as you can see from our ponchos and the flying tent) made it almost impossible for us to continue our journey. After taking shelter for 10 minutes, we decided to continue our journey despite the storm coz we were running out of time and it was 3pm already. We wore ponchos to prevent ourselves from being soaked but it became a huge wind resistance and I looked like a balloon that was gonna burst...lol!! 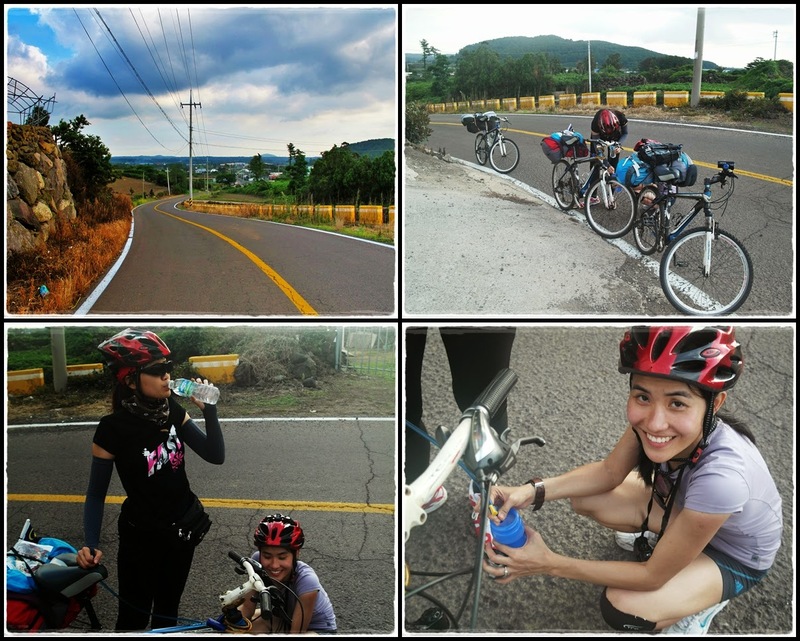 To make things worse, we had to go through a hilly area and I was so tired that I had to get off and push my bike. 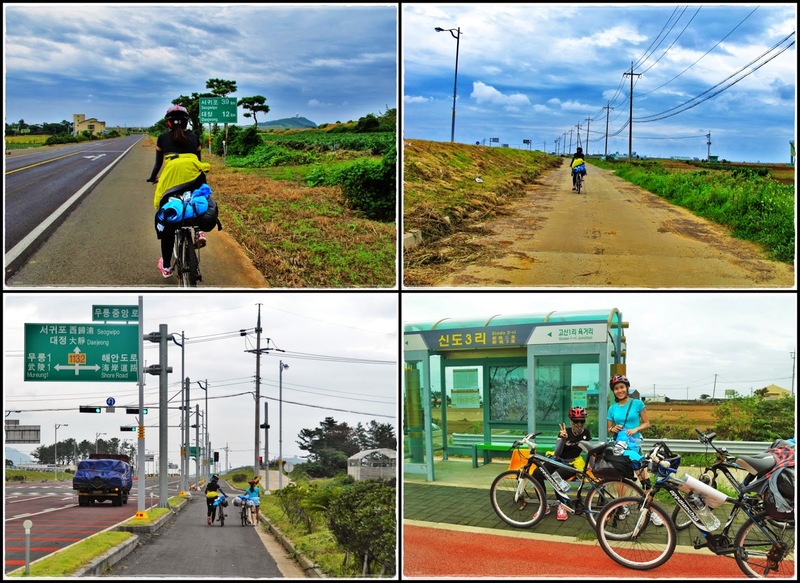 At one point, I was so demotivated and exhausted that I suggested to hitchhike coz we didn't know how far more we had to cycle and I was afraid that we wouldn't be able to get to Jungmun before sunset. We really did try hitchhiking from small trucks but unfortunately nobody stopped. 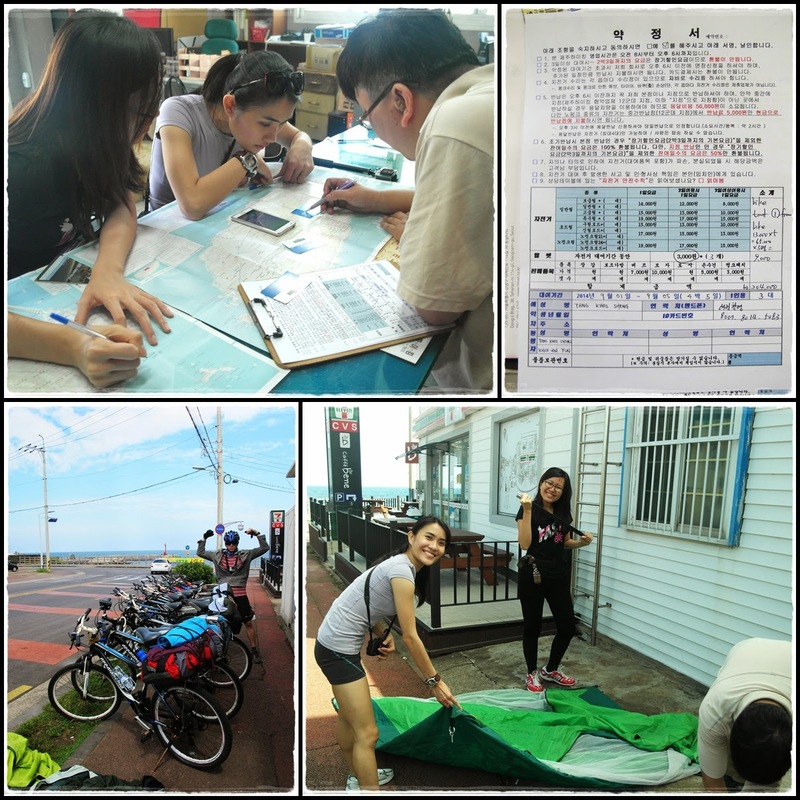 We even asked 3 Korean students to help us to write 'hitchhike' in Korean on a paper but they told us that it's gonna be difficult with 3 bikes. Before they left, one of them used his phone to help us identify our location and told us that we were 12 kms away from Jungmun. 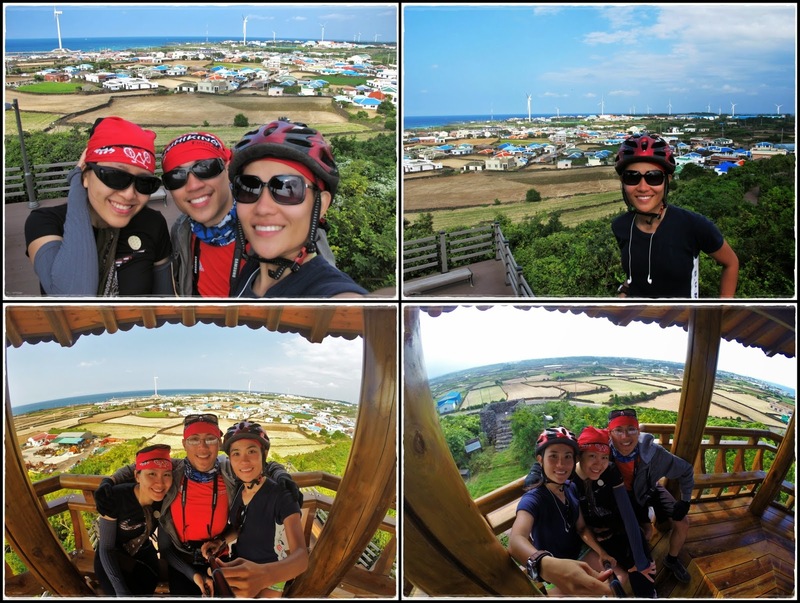 Since our hitchhiking plan failed, we had no choice but to continue cycling and 12kms within 2 hours sounded quite achievable so we decided to push on. Day 2 was definitely our toughest day thanks to the wind, rain, and hills...truly a mental and physical challenge. 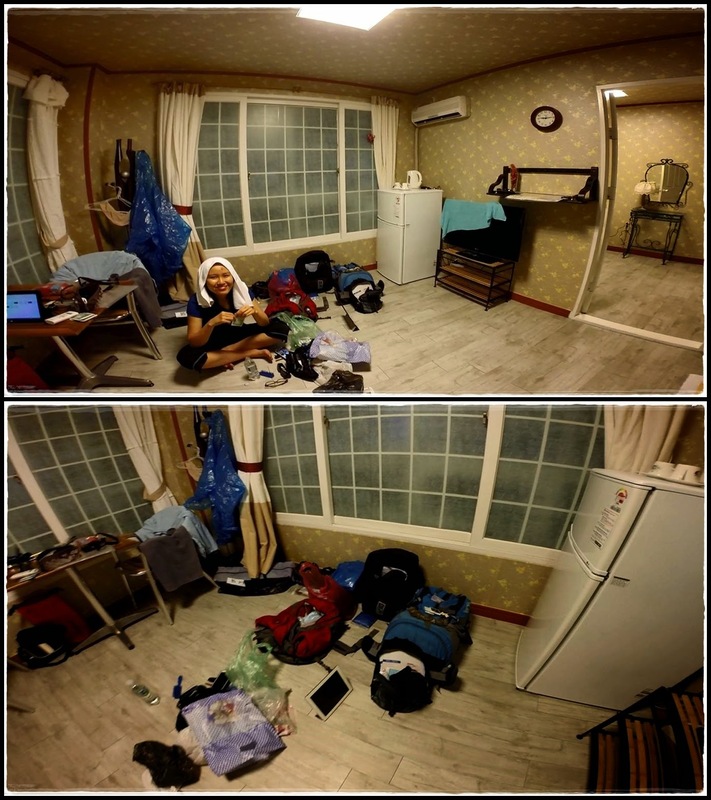 After much struggle, we finally made it to Jungmun Resort Complex at 6pm exhausted and soaked. 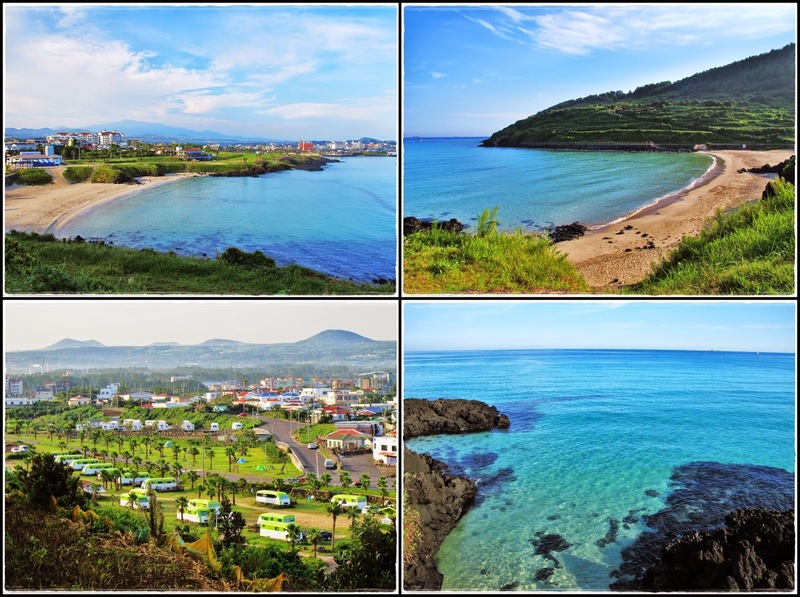 This is where all the luxury hotels in Jeju are located. 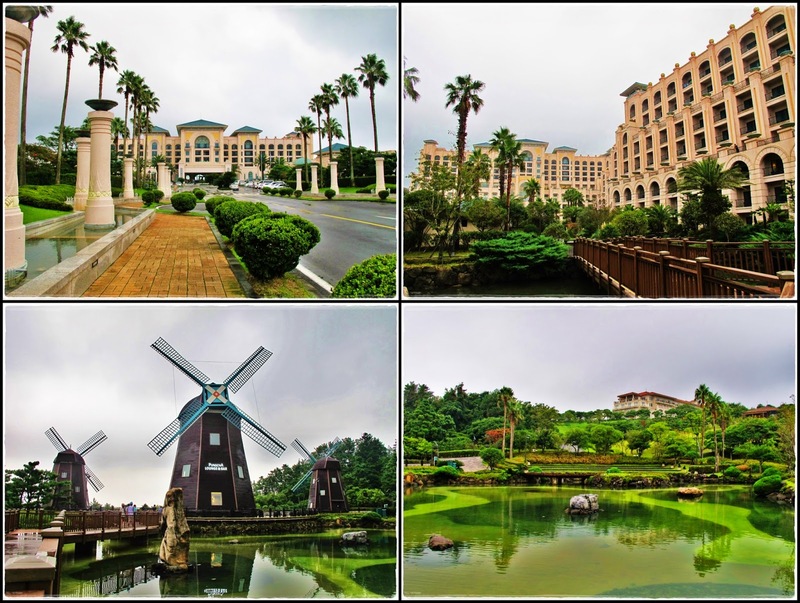 Initially I wanted to visit Seaes Hotel to see Secret Garden's filming site but we weren't in the mood to do much sightseeing after a long day so we only stopped by Lotte Hotel to see the windmill that appeared in many K-dramas. The exterior of Lotte Hotel looks similar to Bangalore's Leela Hotel. 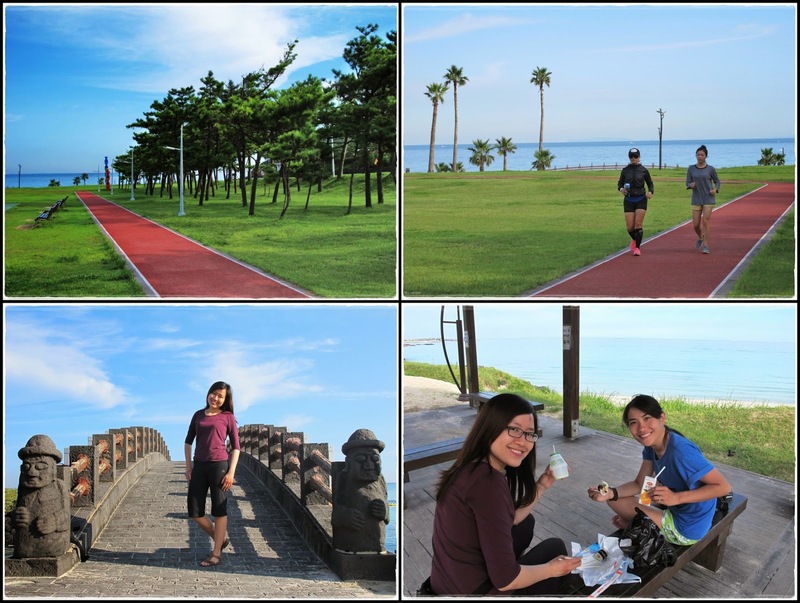 From the windmill in Lotte Hotel, we walked on and came to this walking path that connects to Silla and Hyatt hotel with a view of Jungmun beach below. Originally, we were planning to camp on this beach but after being drenched all day, we desperately needed a nice place to shower and get a good rest. Quote to share: You learn to appreciate the little things in life, things that are often taken for granted and overlooked, once you've gone through some hardships. After a well rested night, we started our journey at 8am after bidding goodbye and saying multiple times of 'kamsahamnida' to this friendly and helpful lady host of the guesthouse. Looked like it was gonna be another rainy day so let's go before the rain comes! Chulbal! After plenty of training on day 2, I'm officially a professional 'bike-pusher'. I even invented my own energy-saving way of pushing a bike...lol!! =P You'll only experience the difficulty of these uphill climbs when you're cycling, but you know you'll be rewarded with an exhilarating downhill sprint at the end of each climb. Perfect song for the photos above: There's always gonna be another mountain, always gonna be an uphill battle, it's the climb. I got to be strong, just gotta keep going, just keep pushing on!! Made a detour to Soesokkak Estuary...the water is so clear!! 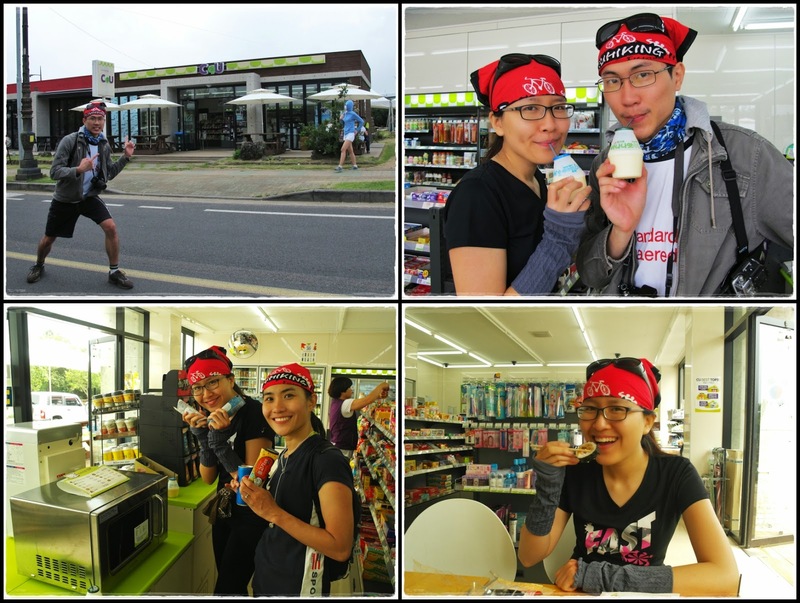 We can't resist ourselves and ended up in a convenient store again coz the food in Korean convenient stores are so good, convenient, and cheap!! Had some kimbap and tried the popular banana milk. The weather had been very nice to us so far and we were already halfway through our journey for the day by noon. I realized that I really can't live without music. The lack of music was one of the main reason why day 2 was so difficult. I put on my mp3 on day 3 and was so pumped up all day! 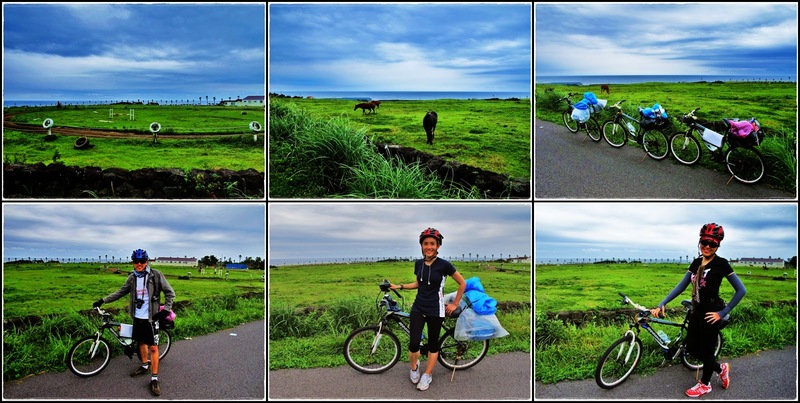 So excited to see the sea again after cycling without any scenery the whole morning. I didn't realize that we looked like Crayon Pop with that helmet on...lol!! Jumping ye jumping ye everybody!! Burnt too much energy cycling non-stop after our kimbap lunch and we were starving by 3pm. Decided to stop by this random local restaurant to fill our stomach. 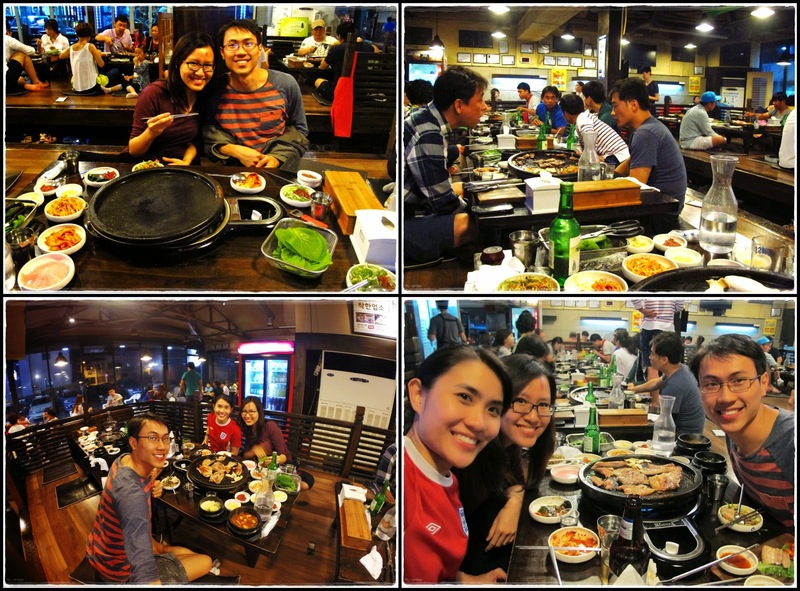 Once again, we had to use our body gesture and very limited Korean to order our food. It started raining again after we left the restaurant but it was already much better as compared to the day before. 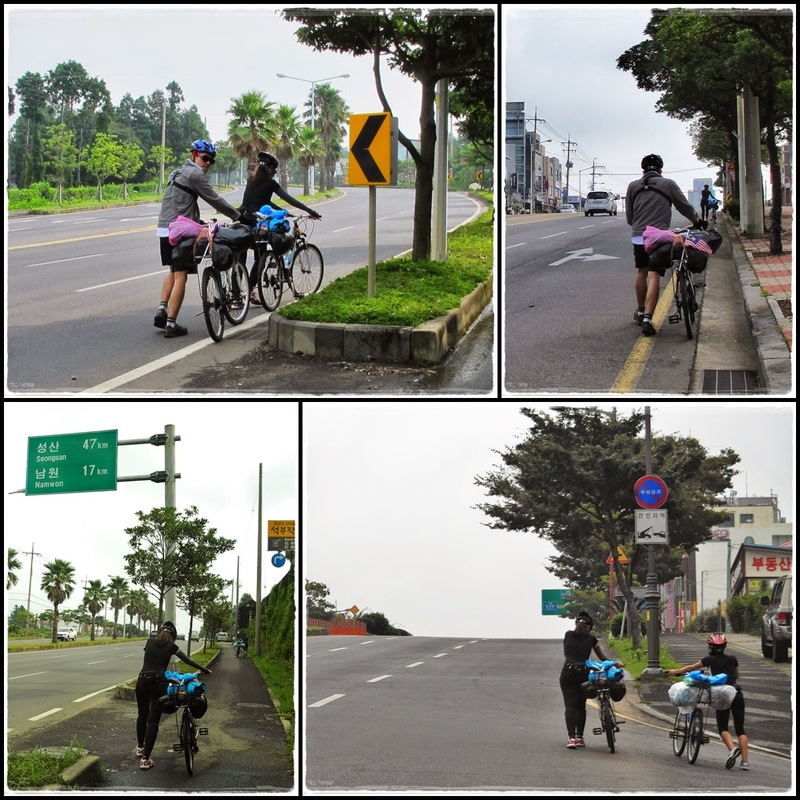 We cycled for about half an hour in the rain and made it to Seopjikoji at 4.15pm. 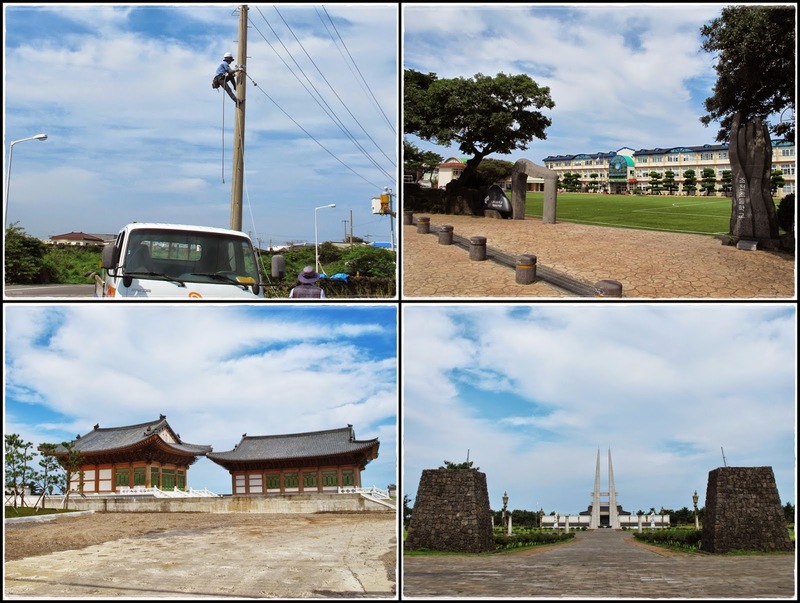 There's actually nothing much here apart from a church that was made famous by the K-drama "All In". 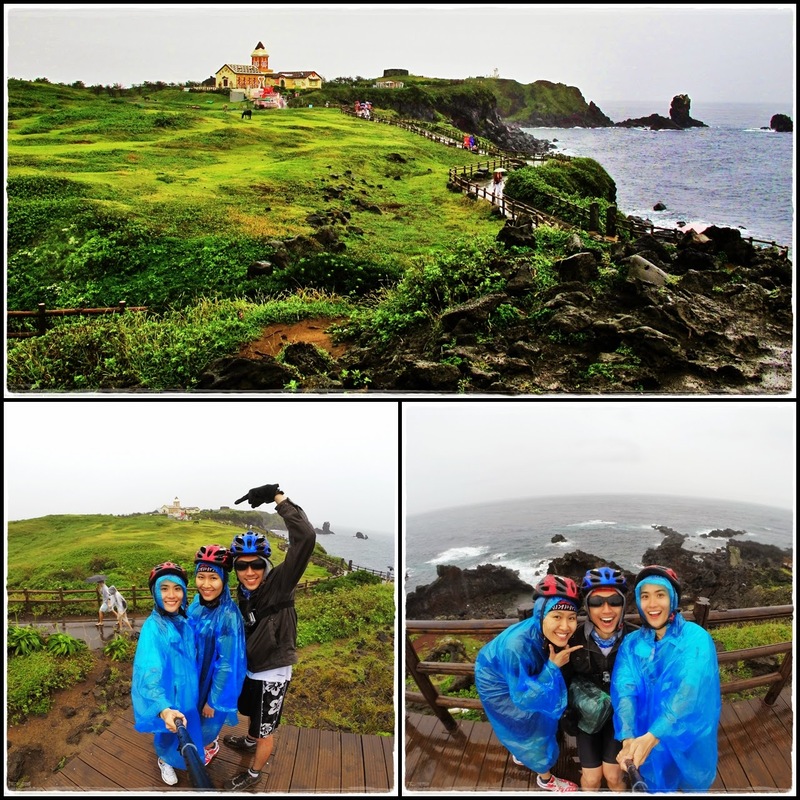 Happily posing with our poncho+helmet fashion...lol!! The rain stopped just as we were leaving Seopjikoji. Hallasan and Seongsan from far. Used our wifi modem and ipad to find our way to the hotel. Woke up at 4.45am, packed up, checked out, and left the hotel at 5.20am to catch the 6am sunrise from the top of Seongsan Ilchulbong. It wasn't fun having to cycle 2.5km at such wee hours, especially when our muscles were still sore from cycling for the past 3 days. 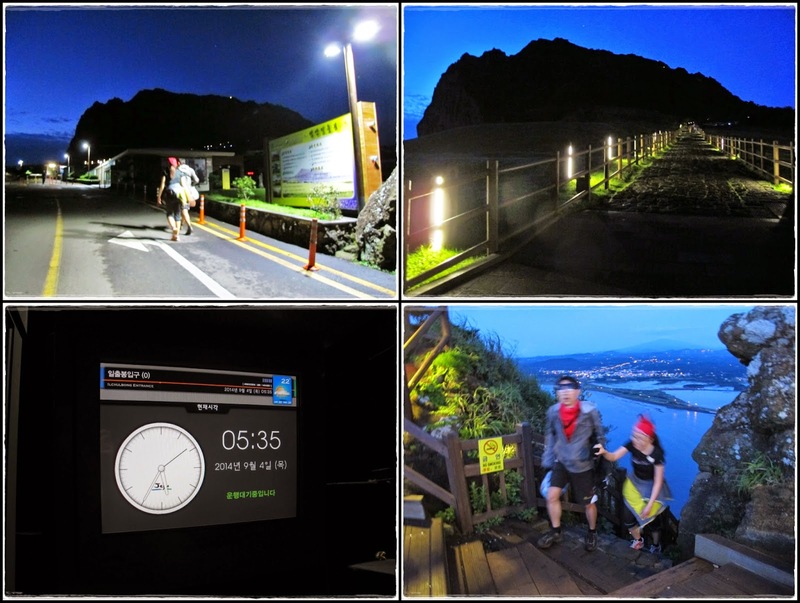 Made it to the entrance at 5.35am and since we were running late, we had to push ourselves to hike as fast as we could to make it in time to the peak. The hike wasn't that difficult and even with our sore muscles, it took us less than 15 minutes to get to the top. Tadaaa...our efforts were rewarded with clouds instead of sun...lol! I checked the weather forecast the night before and was expecting this but we couldn't afford to start our day late anyway coz it was gonna be another long day ahead. 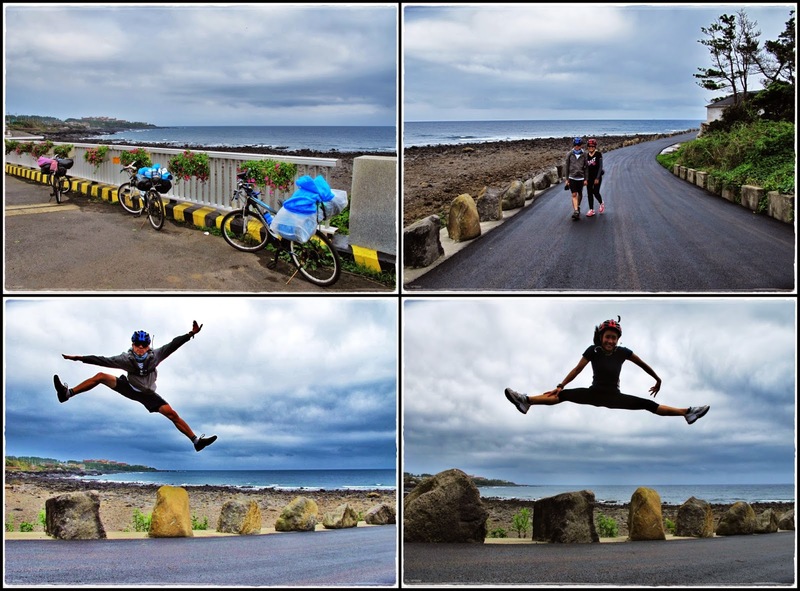 Goofing around to kill some time while enjoying the view coz it was still too early to catch the first ferry to Udo Island. I know this is the latest trend but I find this very entertaining. I was having so much fun being a paparazzi observing these people...lol!! First glimpse of the sun after waiting for 40 minutes. So excited to see the sun after 2 rainy days! Looks like it's gonna be a beautiful day ahead!! 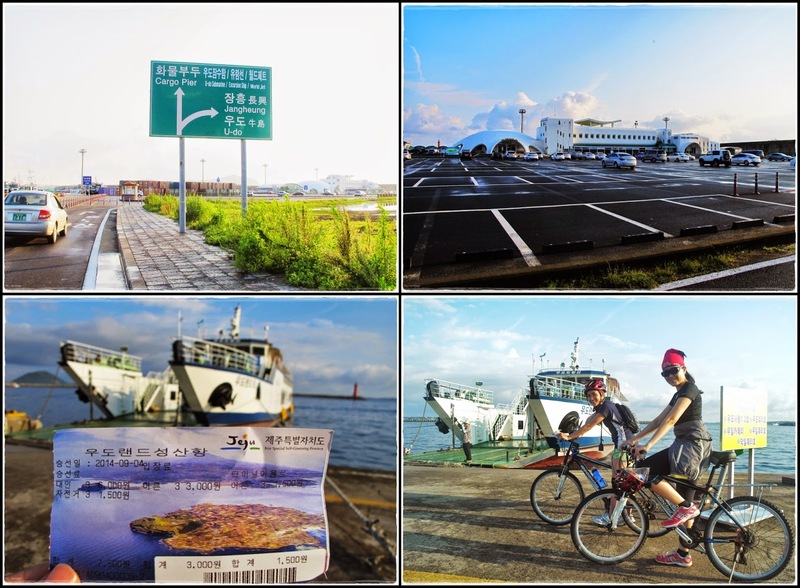 Cycled 2km to Seongsan Pohang Passenger Terminal to take a ferry to Udo Island. 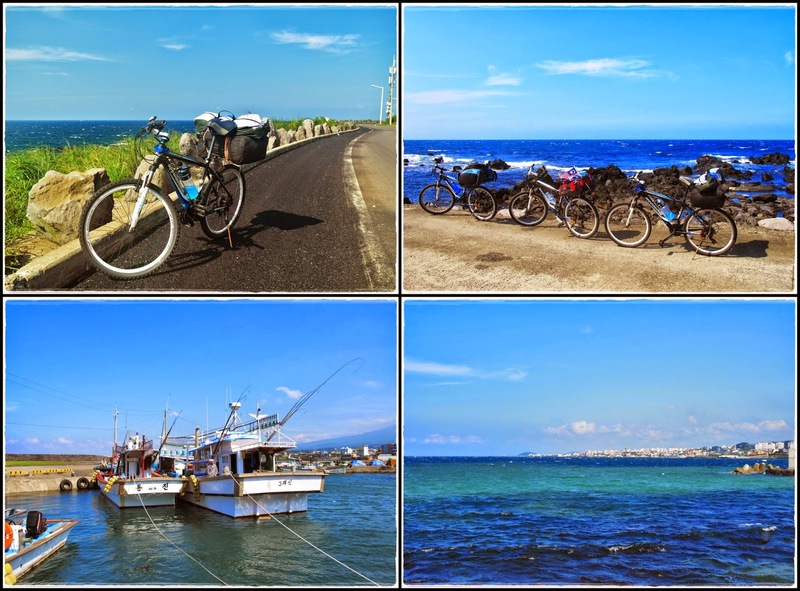 Our return ferry ticket costs only RM20 per person with bikes. We managed to get on the first ferry that departs at 8am. 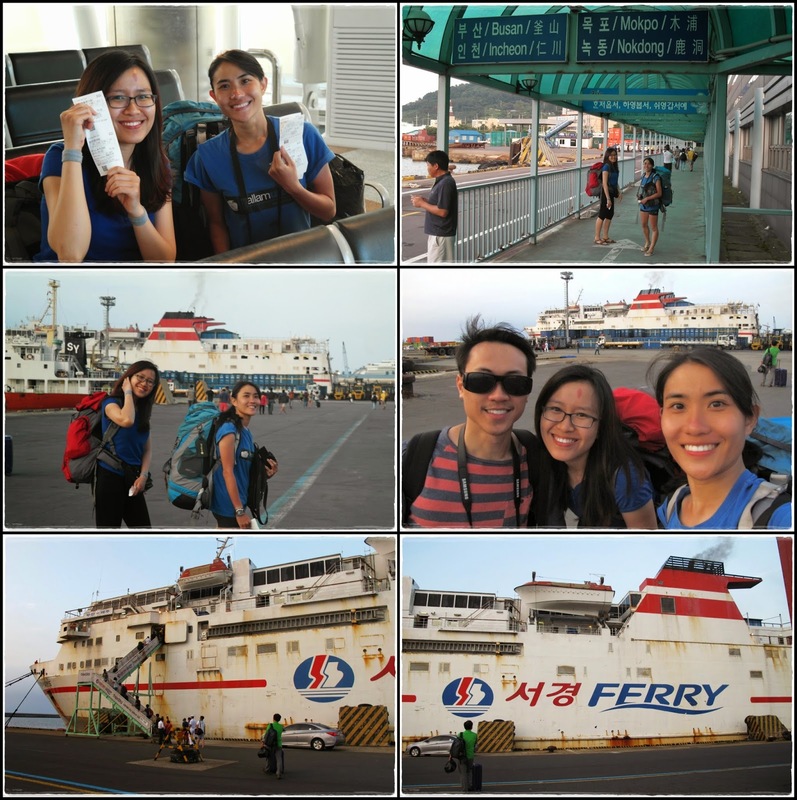 We were the only ones with bicycles on the ferry coz most people either drive or rent one after they get to Udo. We opted to sit at the top deck coz we didn't wanna stink the 2nd floor tatami area with our smelly shoes. I was so sleepy and passed out during the 20 minutes journey. 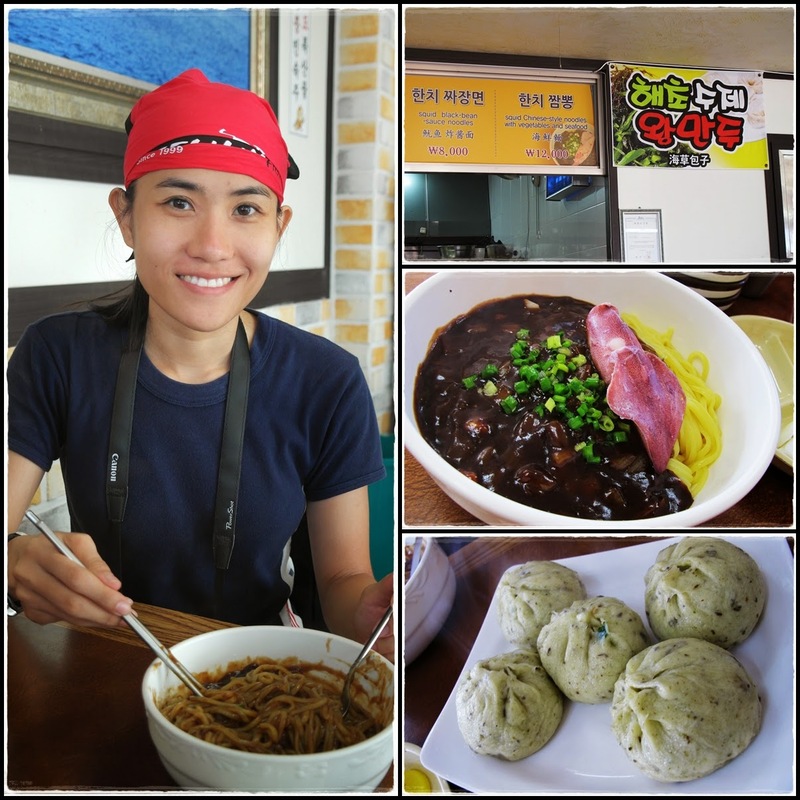 First stop in Udo Island...Jajangmyeon (black bean noodles) and seaweed dumpling for breakfast...yummy yummy!! Peanut & orange ice-cream for dessert. The owner of that shop was very friendly and made us 'customized' ice-creams. He made a couple ice-cream for bro and Xin Yun, and I got 'Daniel' coz he wanted to make me a bf/husband ice-cream...lol! Not sure how true this was but he told us that he used to be BEAST's manager and there were photos of him with a lot of artists all around his stall. Time to explore this beautiful island after filling our stomach. Perfect weather!! 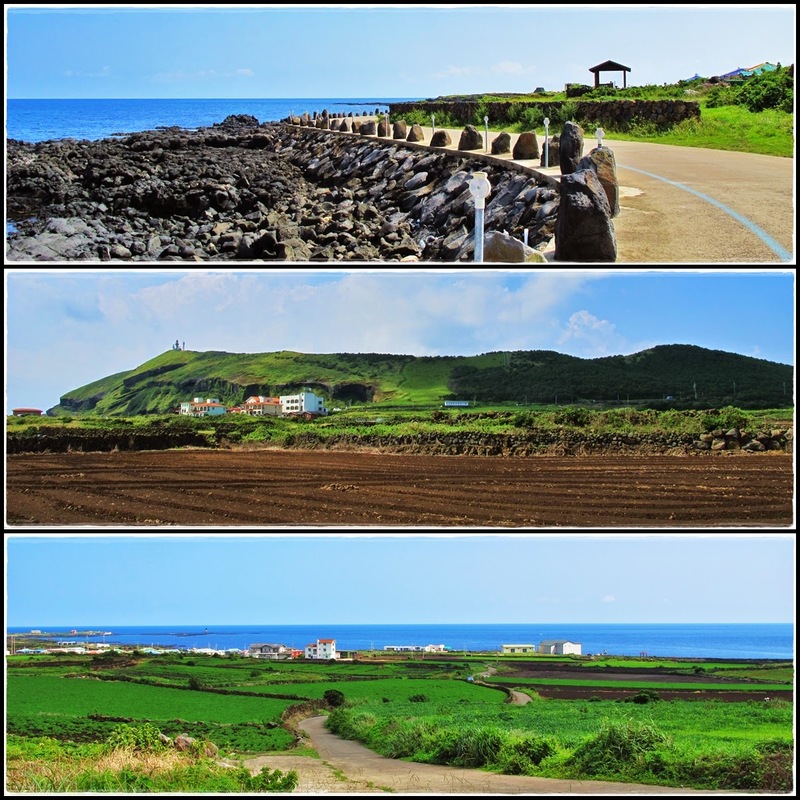 It's only 13km to go around the island along the coastal road, like a miniature of Jeju Island. The island was quite deserted when we were there. Saw a local uncle walking by holding a few fishes, he probably just came back from fishing. Mang-Ru Lighthouse. 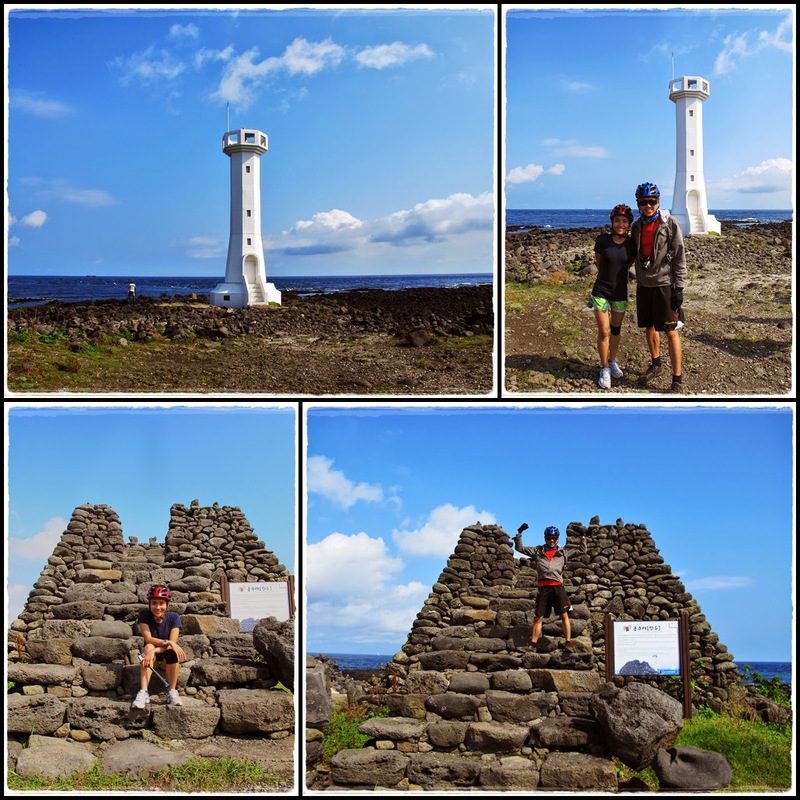 There are plenty of lighthouses all around Jeju but this was the only one that we stopped for photo. 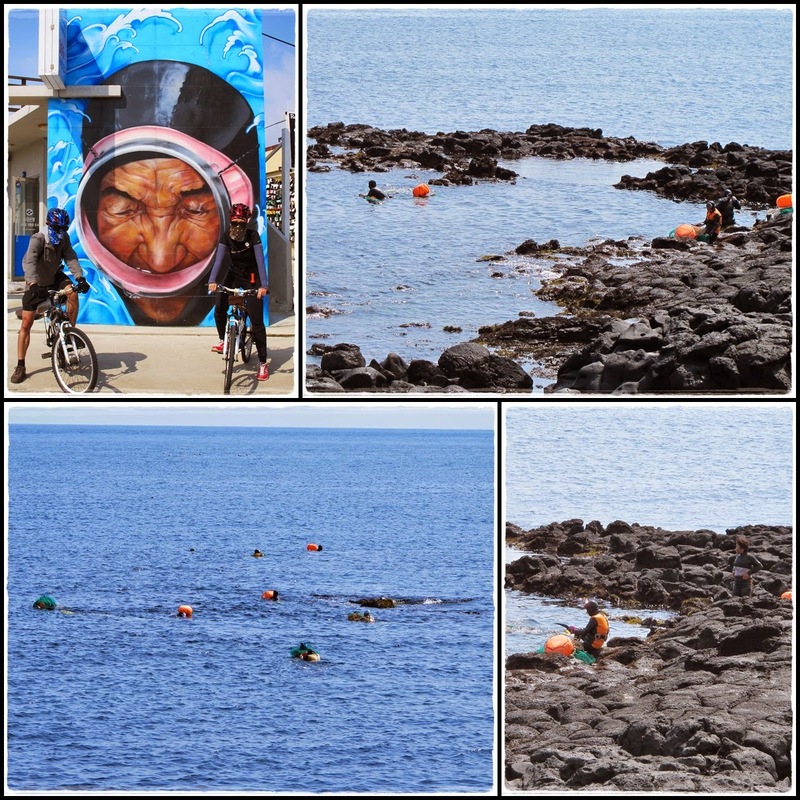 Finally spotted Haenyo (sea women), the intangible heritage of Jeju. They are easily spotted in black rubber suits and glass masks. They are known for the ability to dive without tanks and can hold their breath for up to two minutes at a time, harvesting the freshest seafood in the world. 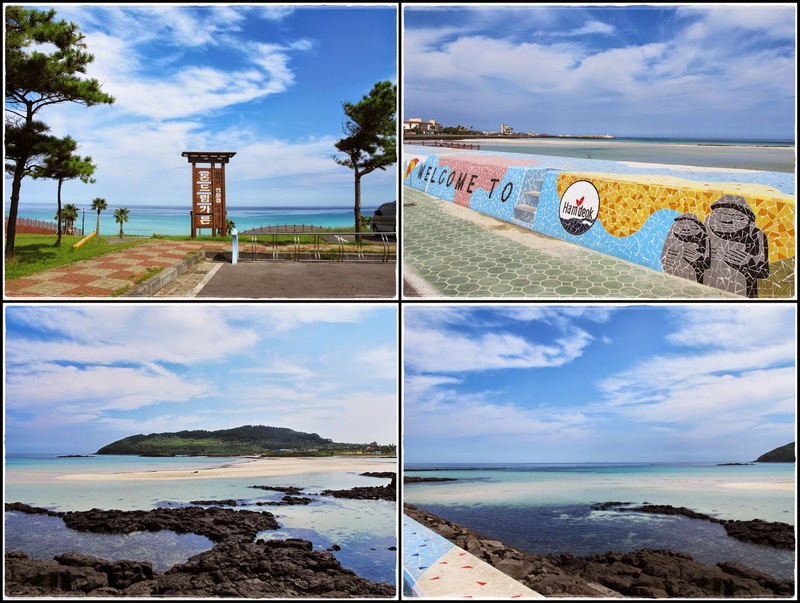 Panoramic view of Hagosudong beach...so beautiful and relaxing! 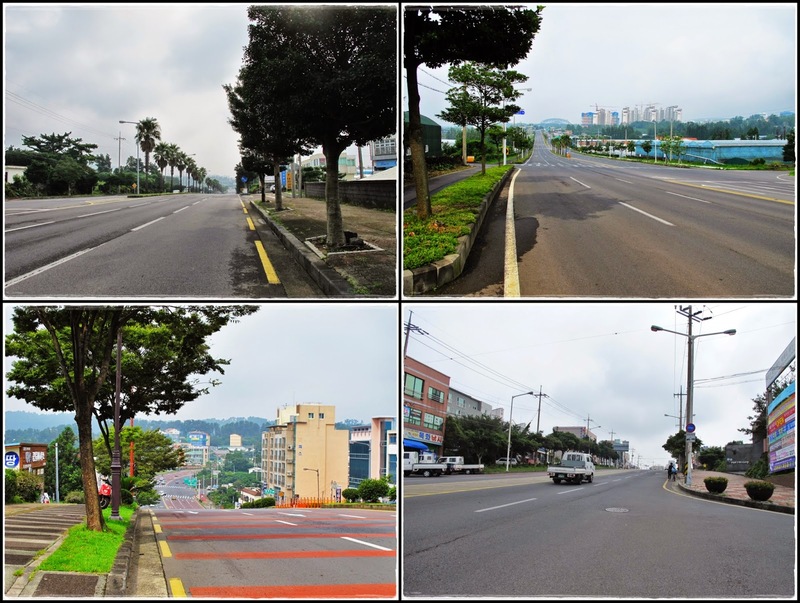 No cars, no pollution, just beautiful scenery all around!! 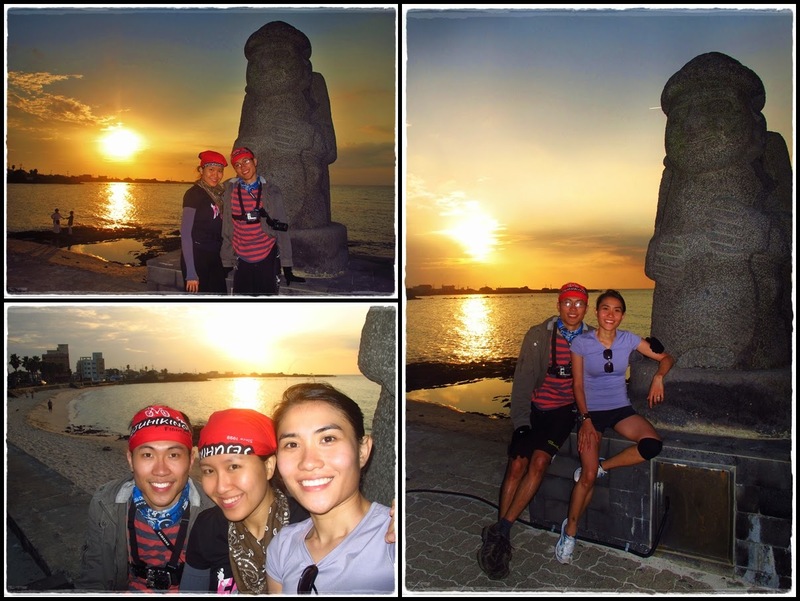 Dongangyoeng cave...our last stop on the island before heading back to the pier. Made it back to our hotel by noon to have some lunch and collect our baggage before continuing our journey. It's been a very productive morning filled with sightseeing. 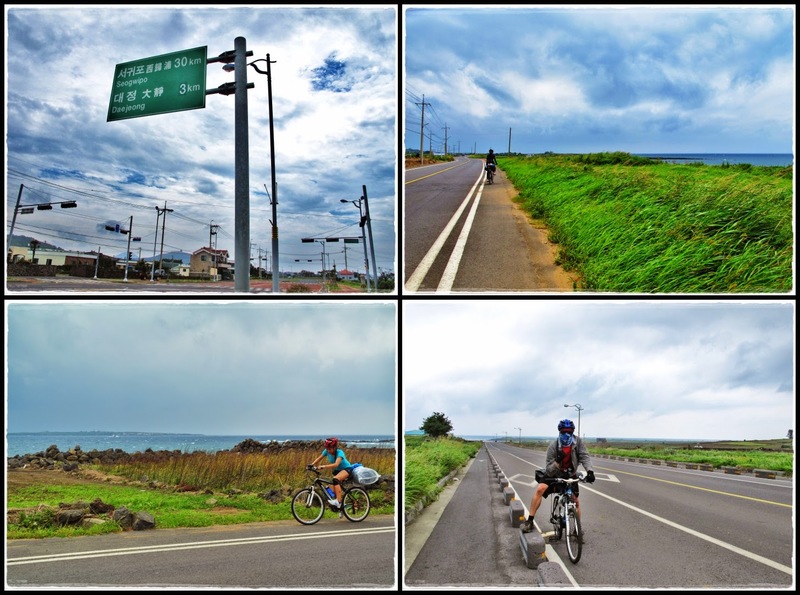 The only thing left for the day was to cycle 40km to our last overnight destination in Jeju. I started cycling with my flip-flops (to dry my wet sneakers) but quickly realized that it was too dangerous. So far each of us has had a minor accident but fortunately nothing serious. Random sights along our journey. 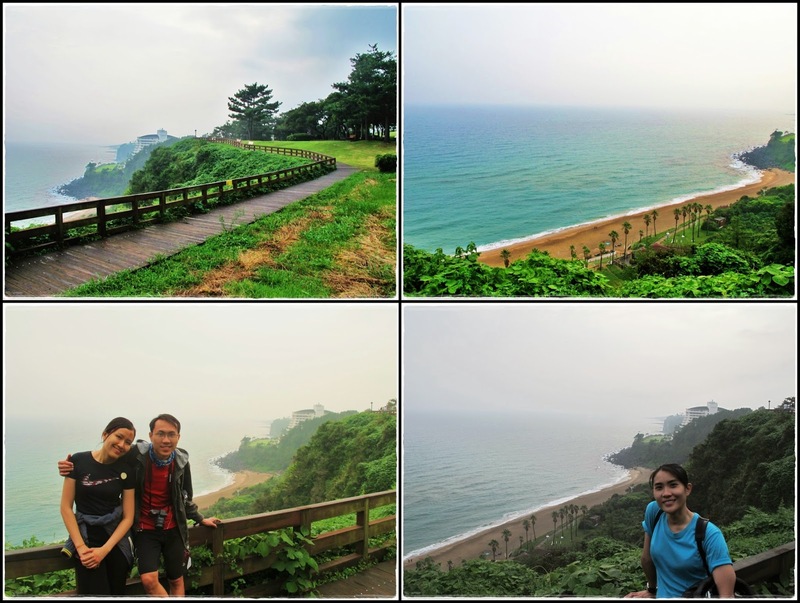 The journey to Hamdeok beach was quite boring coz we took the highway instead of the coastal road. 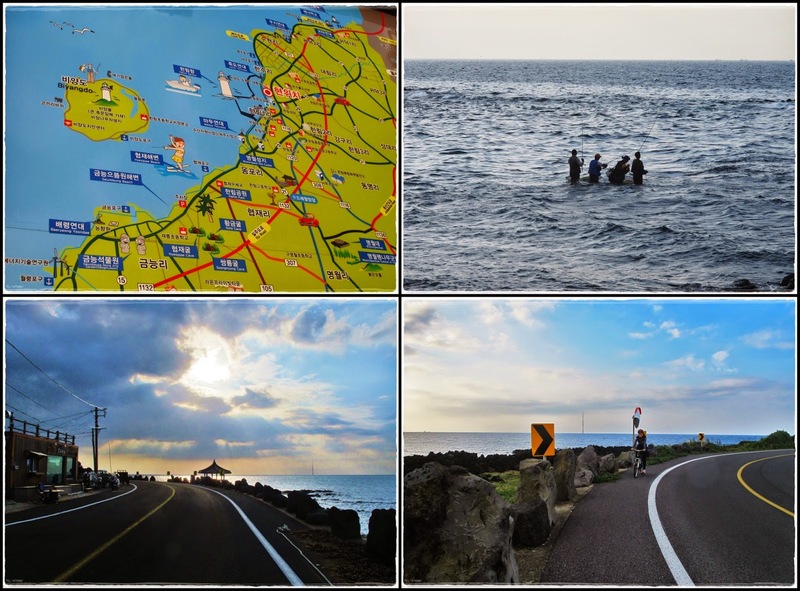 Throughout our 5-days journey, we constantly had to make decisions between taking the highway vs coastal road. It's like taking chances coz we didn't and wouldn't know which option was better. Even though highway may be shorter, it doesn't necessarily mean that it would be easier and faster as there would be more uphill climbs. Quote to share: The shorter route may not be the faster route; the faster route may not be the easier route. You'll never know what others have been through unless you've traveled the same route and experienced what they've experienced. So don't judge. 360° from the hut. I looked like Crayon Pop again...haha!! Another rest stop to replenish our water supply and examine my tan result. 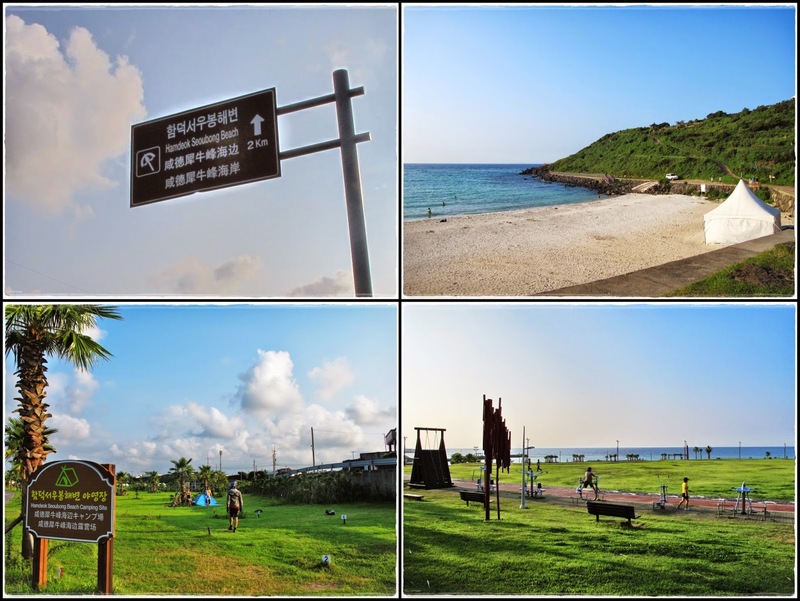 Finally made it to Hamdeok Beach at 5.30pm. Nice beach and campsite! 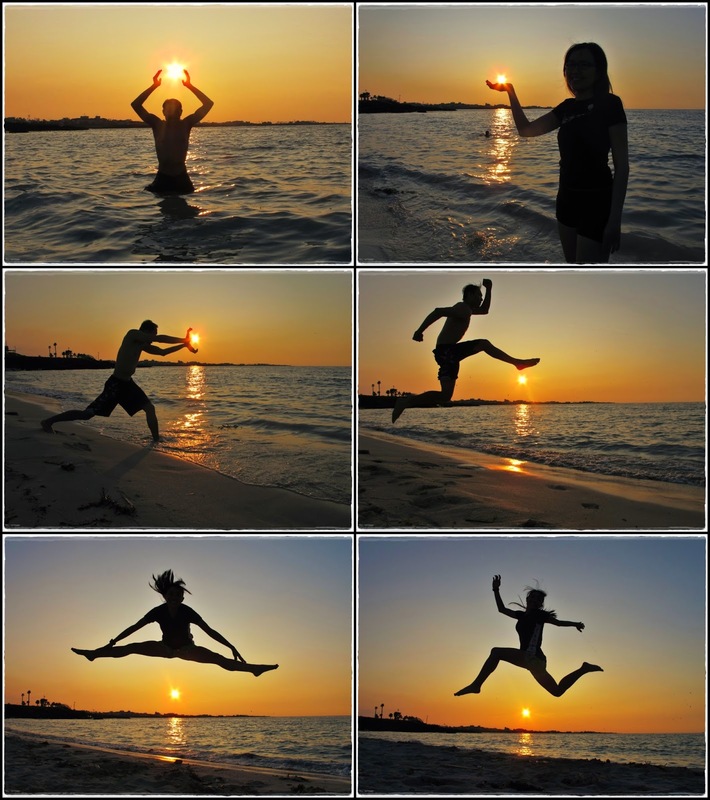 Having fun with the sun by the beach while waiting for the sunset. Had fun being a photographer as well. 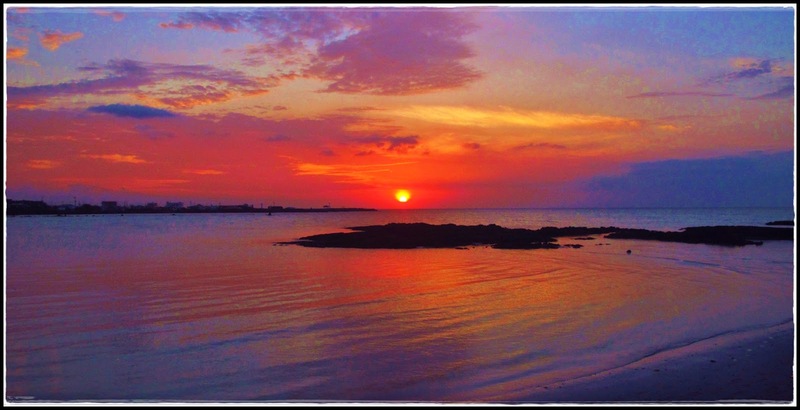 Beautiful sunset at Hamdeok Beach. Once again, pitching our tent in the dark. We were almost in trouble coz our tent pole's elastic cord broke. But with 2 handy-women around, this problem was easily solved...lol!! Had our dinner at 9pm after settled down at the campsite. We didn't look very excited looking at the menu coz we were too tired and hungry to think of what to eat...our expression was pretty funny...lol!! This dinner was a good one. 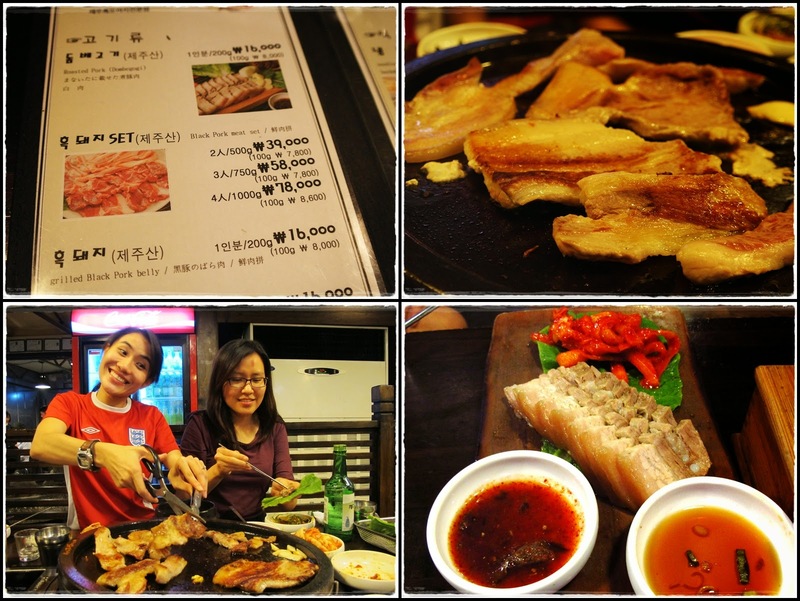 Not sure if it was because we were too hungry or what but everything tasted so yummy!! 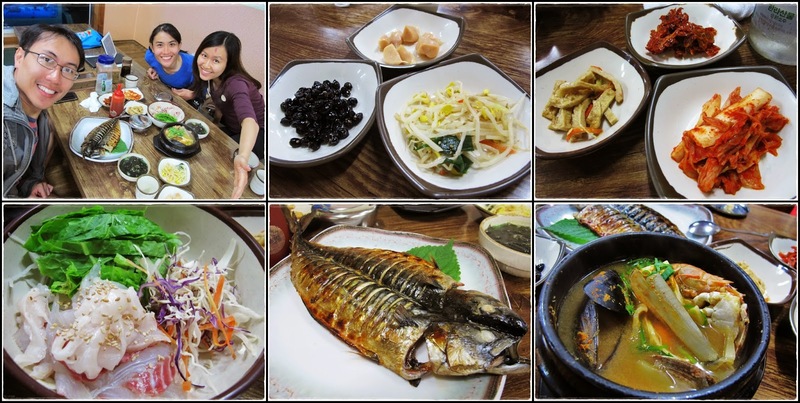 The raw fish bibimbap, roast mackerel, seafood stew, and the side dishes...sooo good!!! Good morning Hamdeok beach!! What a beautiful day!! I was too lazy to walk around so bro and Xin Yun went for a stroll and bought back some breakfast. Random sights along our way. Bro 'promoting' his bike pants. 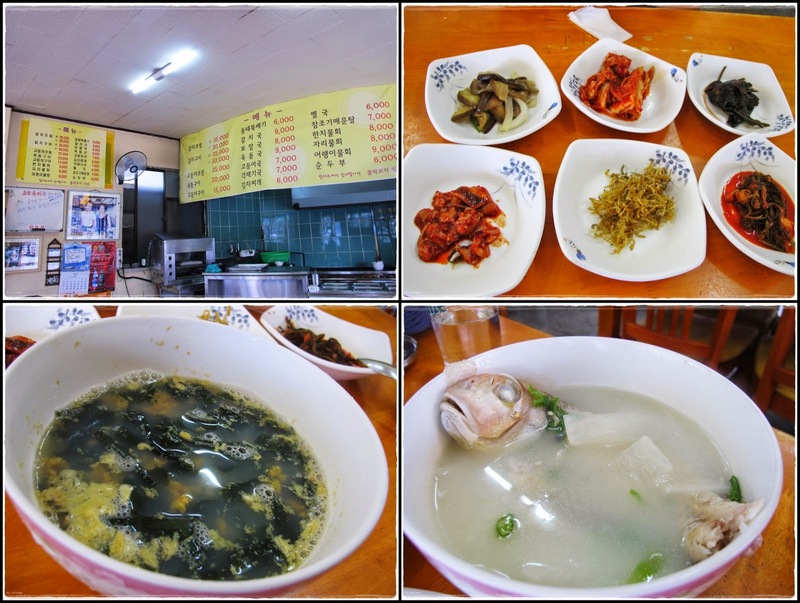 Took us quite some effort to order our food at this place due to language barrier but this was one meal that I don't miss coz I'm not a fan of fish soup. 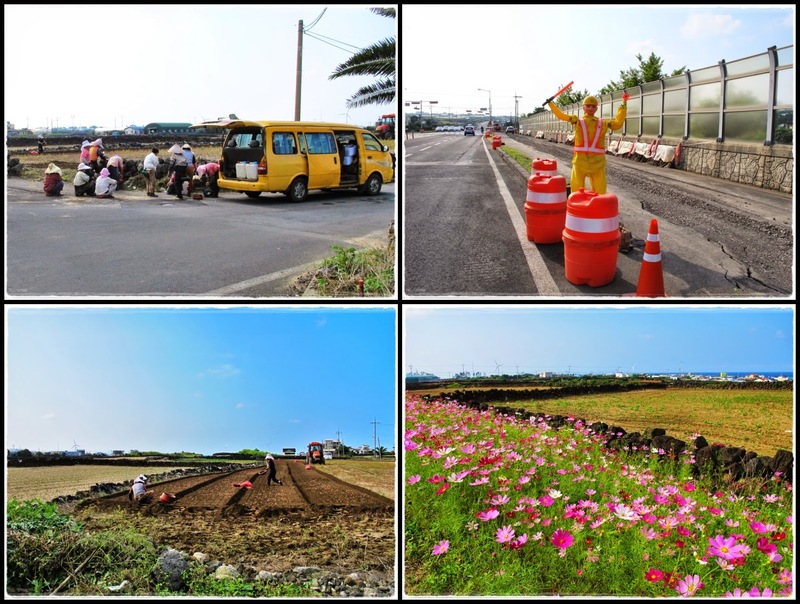 Back in busy Jeju city again after 5 days!! 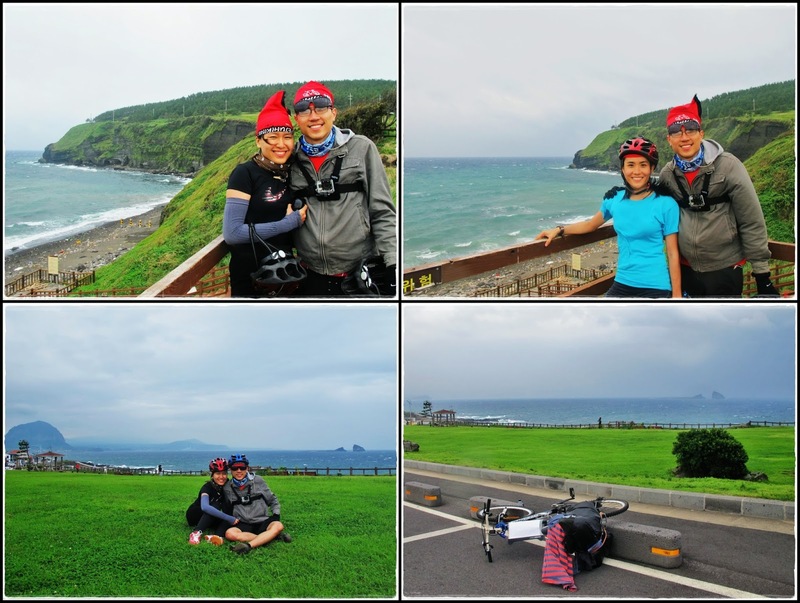 Cycling 270km around Jeju Island in 5 days...MISSION ACCOMPLISHED!!! It has been a tiring journey but definitely an interesting and memorable adventure!! 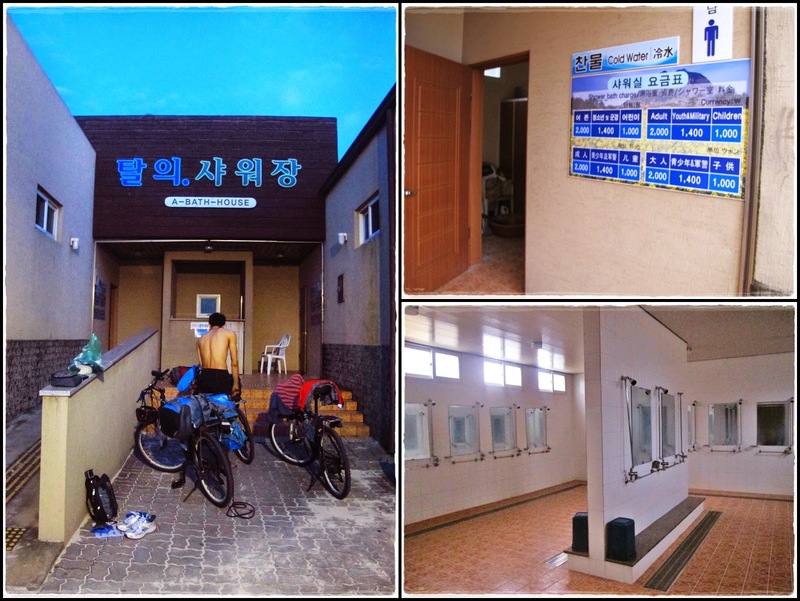 After returning our bikes, we walked to this Jimjilbang (Yongduam Sea Water and Sauna Club) to have a good shower and rest. 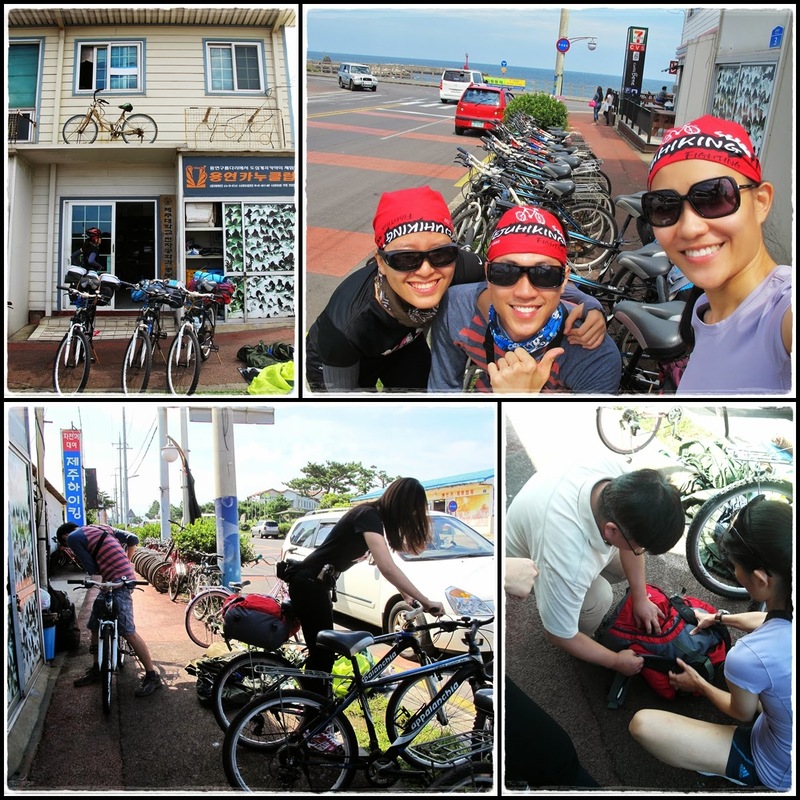 The bike shop staff dropped us at the ferry terminal to purchase our tickets for the 7pm overnight ferry to Busan. 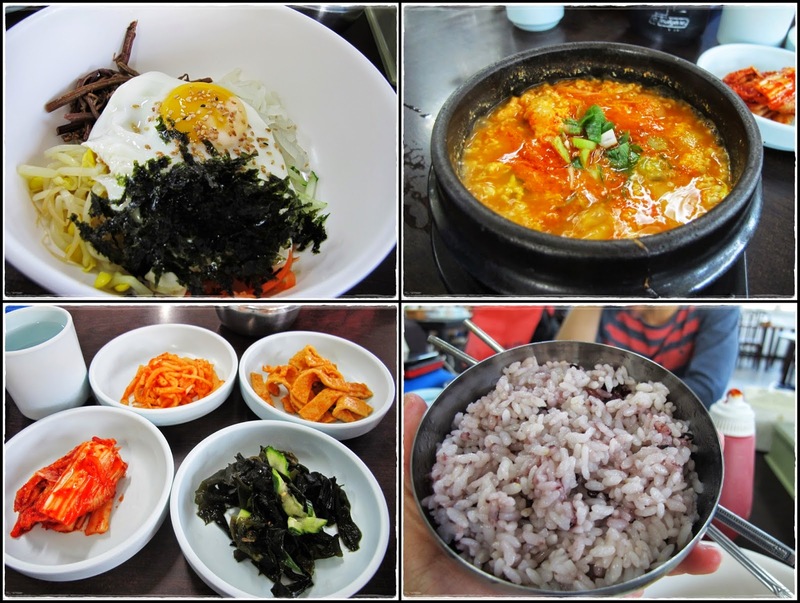 It costs KRW51550 (RM163) per person. Slightly more expensive than the flight but we got one night of free accommodation onboard. Dinner at the ferry terminal. I looked quite burnt. 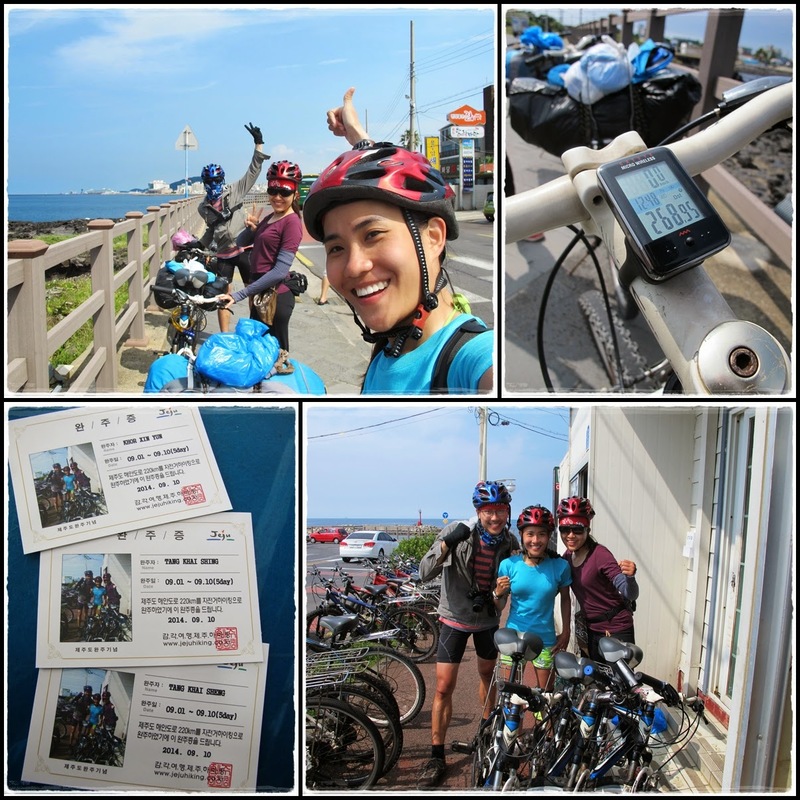 I am amazed with your cycling trip and intended to do it as well. I saw you share a list in a paper and it was too small to view. Do you mind to share with me your itinerary? Thank your very much! You are kind and helpful! 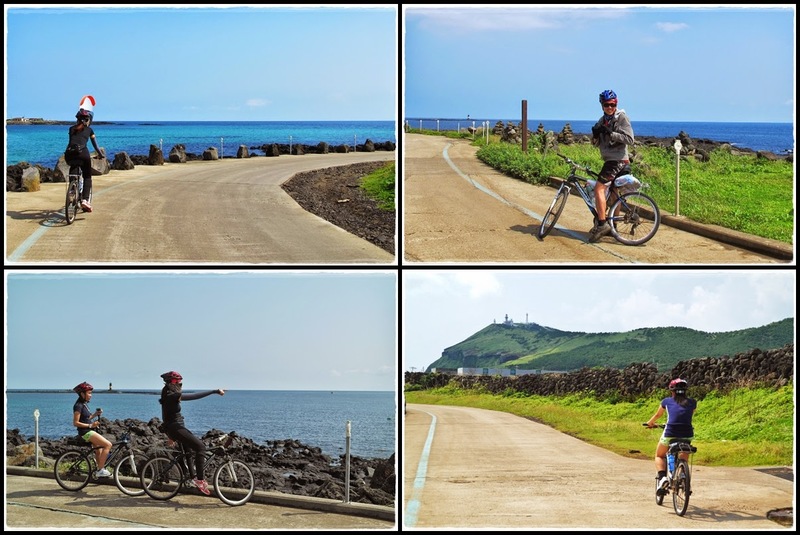 I am going to cycling around Jeju next month. 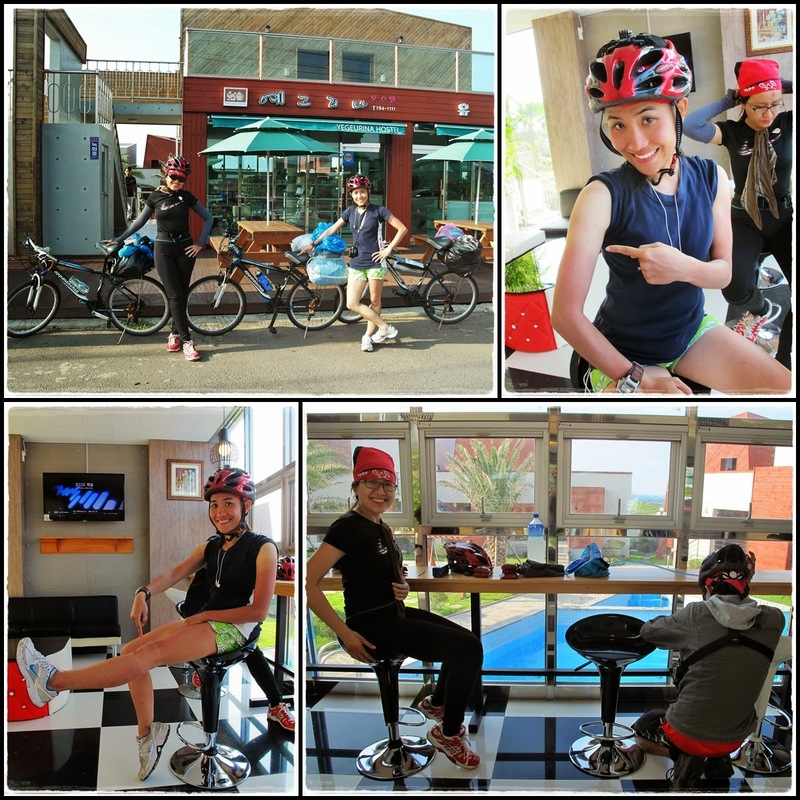 I would like to know how did you make the bike reservation with the bicycle shop in Jeju? I've tried to contact some of the shop owner (by email & by phone call), but most of them couldn't understand english at all. 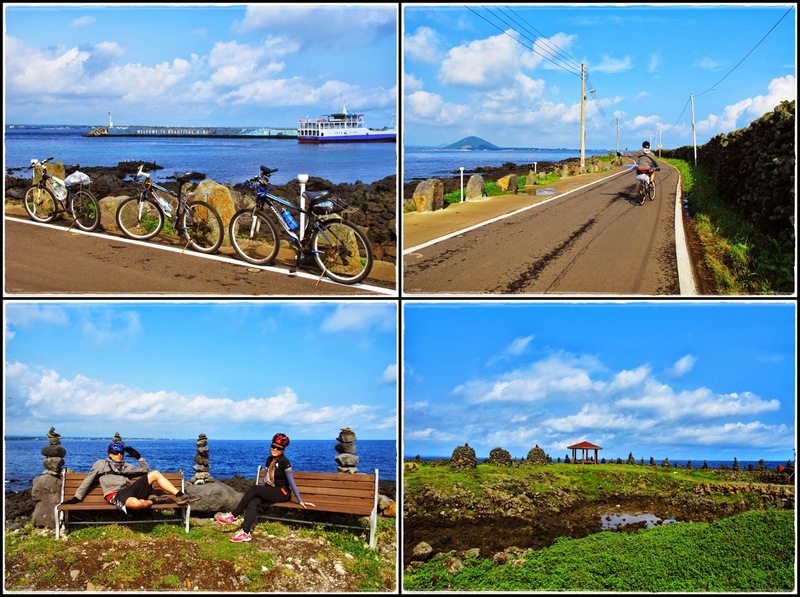 I am going for a cycling trip in Jeju in June. I have not been able to contact any of the bike shop owners. Please advise how you booked the bikes online. I am Jihee from Trazy, an online travel booking platform exclusively focused on Korea and currently expanding its service to Thailand. We are currently looking for travel bloggers who have quality content on destinations in Korea, hoping to collaborate and grow together. We run a commission based affiliate program and exclusively work with our affiliates for sponsorship, too. You can easily sign up at https://www.trazy.com/affiliate. Also, feel free to ask me any questions about the affiliate program. You can contact me at trazycrew@trazy.com. I would be happy to give you more details!